OK! Here we are again…week three is already upon us! If you’re new here, let me fill you in on what’s going on! 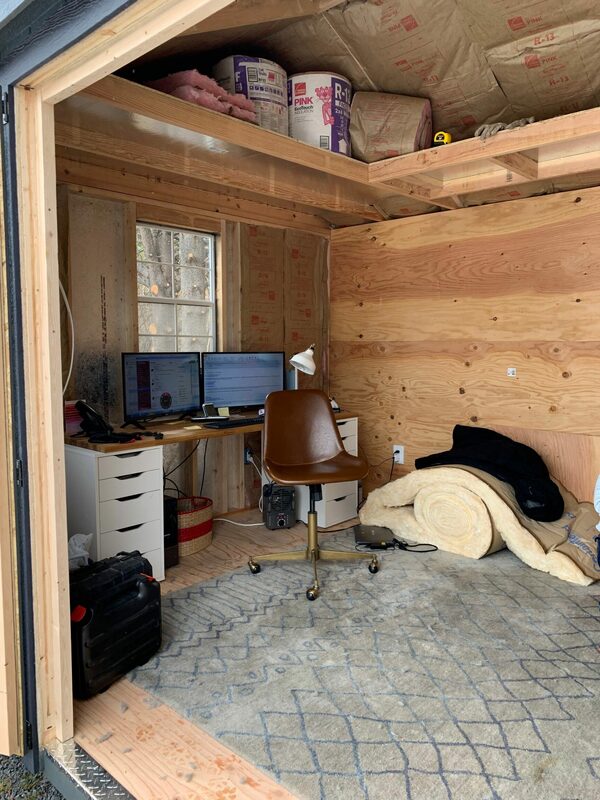 I am totally redesigning an office space/outdoor shed for my husband, who works from home, as part of the One Room Challenge. If you would like to catch up in order, here’s a link to Week One and Week Two. Once again, here’s a looky at my vision or plan for the space. So this week was all about paints and stains. 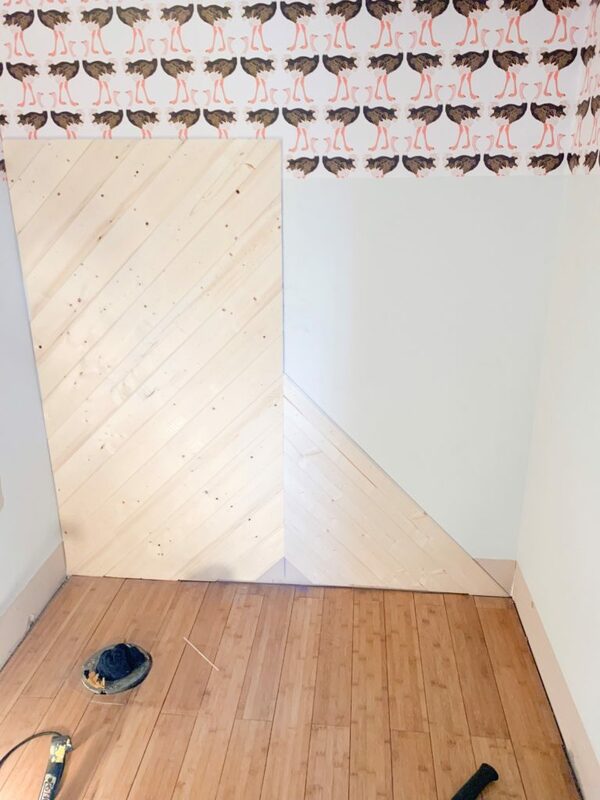 I needed to make a choice for a treatment for the floors ( 1×6 pine boards) and I have been planning on a moody accent wall since we began envisioning the space. 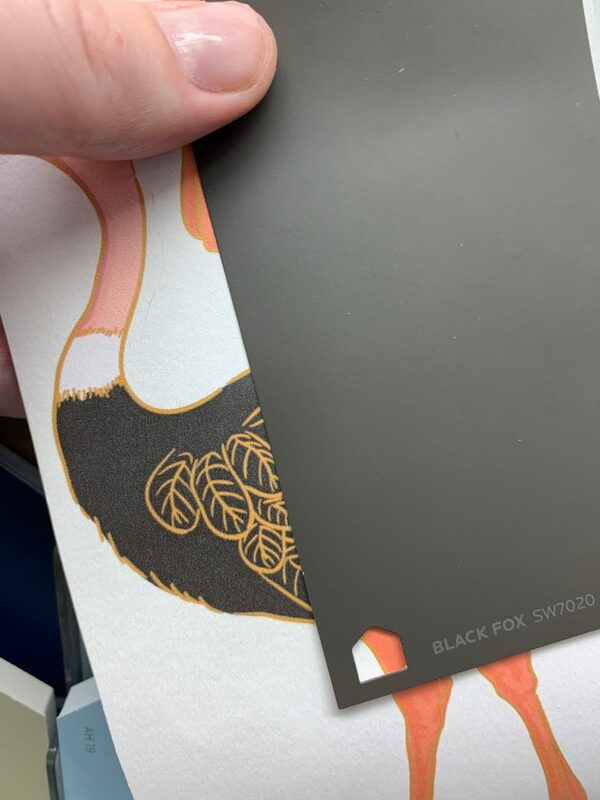 I needed a rich, dark color and after looking at 975,873,489 black(ish) paint swatches, I landed on Black Jack by Benjamin Moore. Here’s the wall for which the paint was intended. The sofa that is going to be sitting against this wall is a butterscotch color and I’m so excited to see it just POP against this moody color. In fact, I just recieved word today that the sofa is shipping out in the next few days….someone pinch me! 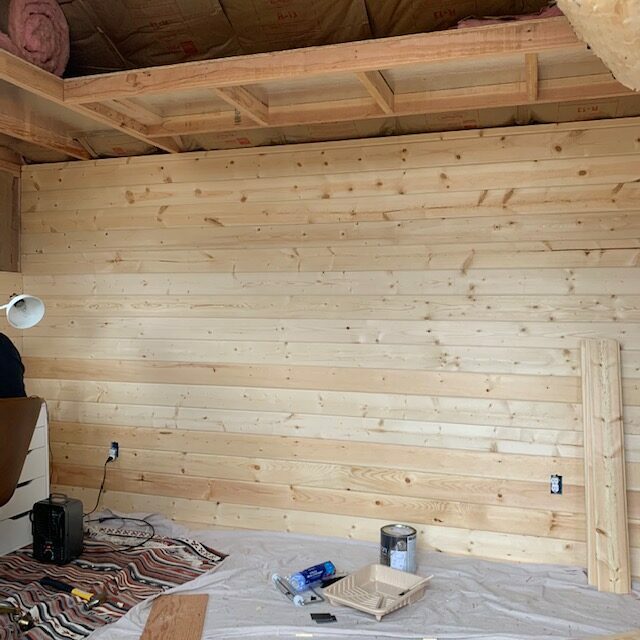 I have painted lots of walls during the course of my diy adventures, but painting wood paneling is no joke. Getting the paint between the boards is a time sucker. 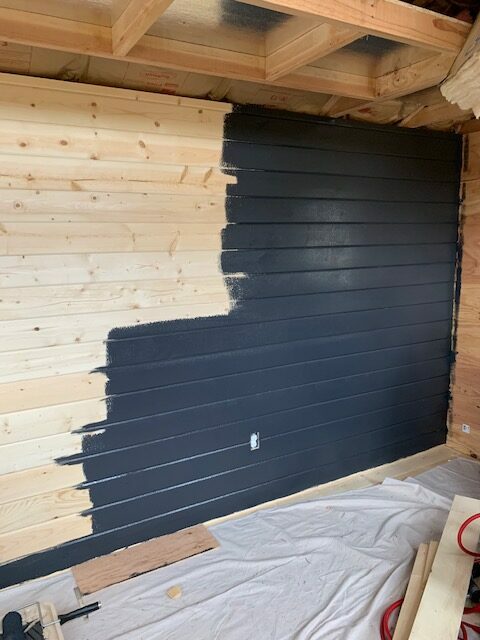 Also, a tip that I thought I would share would be, that if you’re planning on painting paneling a dark color, paint the wall behind in a dark shade before you install the wood. 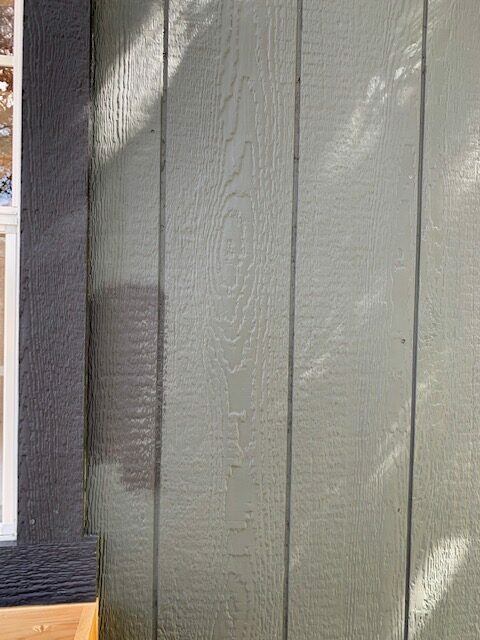 This way, any cracks that are visible when you finish installing, are already dark in color. Mmmmmmkay?? Out of the three previous photos, the third one most accurately represents the color in real life. And of course, I went with a matte finish because I just can’t ever get enough of that velvety finish. Next up was choosing the stain and polyurethane for the floors. 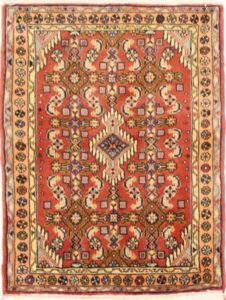 I mentioned this in my last post but a very wise reader wrote and warned me that if I didn’t use some kind of stain, then the floors would eventually darken and yellow. A look that I am trying to avoid. 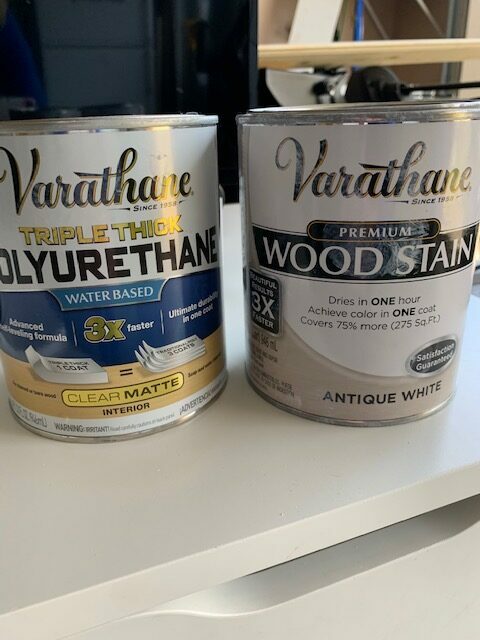 When I found this antique white by Varathane, I knew I had found what I was looking for. It gave the floors a very bright white look but didn’t cover any of the wood grain or knots. I applied the first coat of polyurethane just this afternoon and am still undecided about how many coats I should do. I will probably do at least one more for good measure. 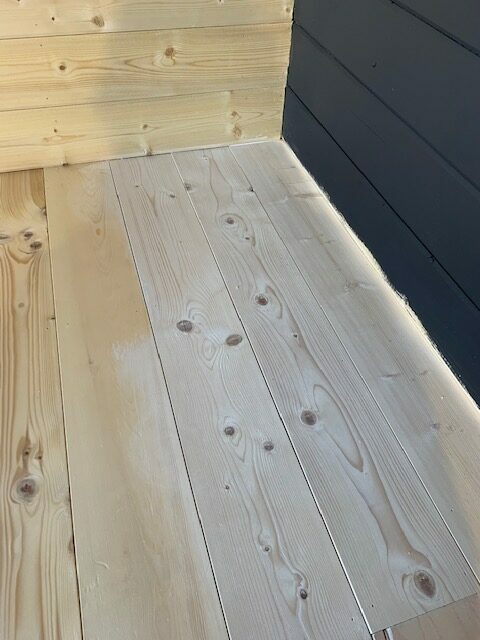 It is pine which means it’s a very soft wood, so we need maximum protection. Hi guys! It’s week two already, and things are happening over here! 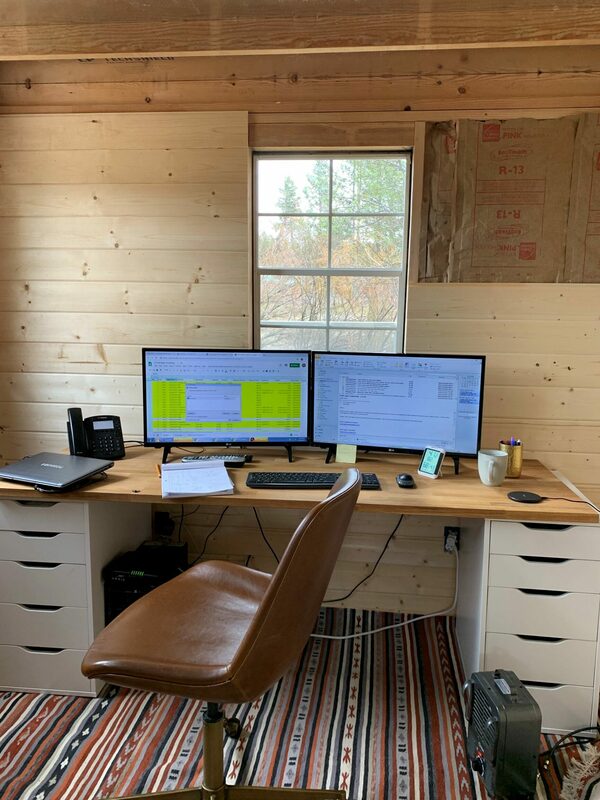 Last week, I let you in on my exciting plans to completely revamp my husbands shack of an office as part of the One Room Challenge. 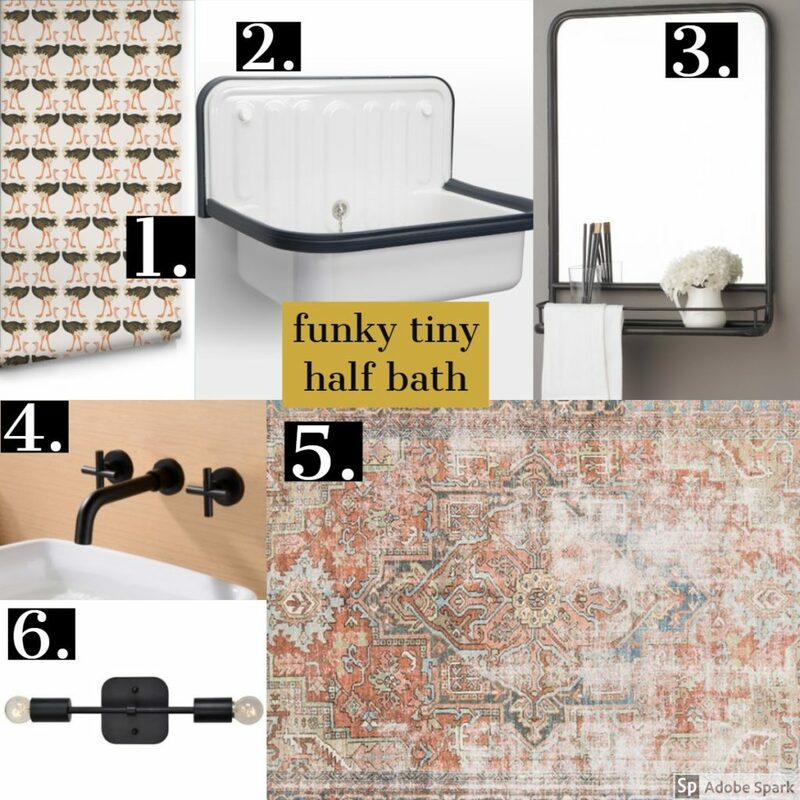 And just a refresher, here’s a look at the mood board from which I’m using to plan the space. 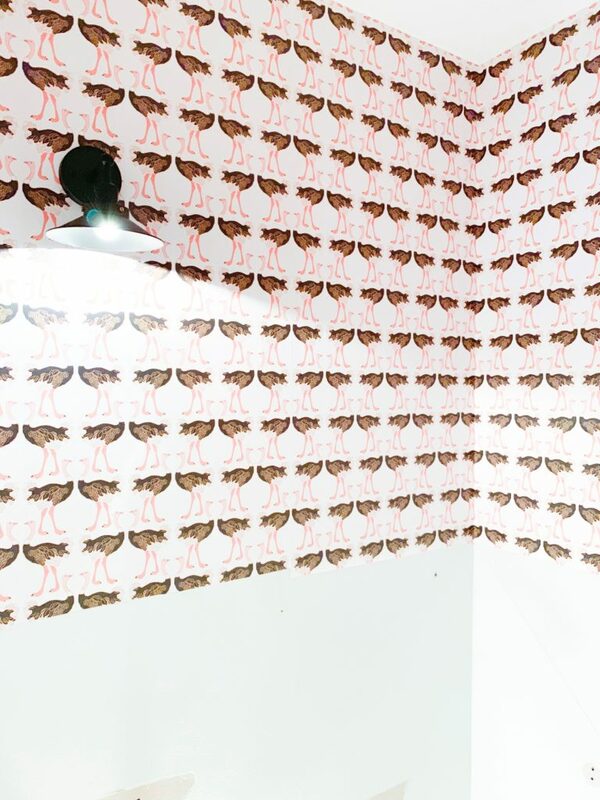 So this week was all about the floors and walls…as in, we needed both. 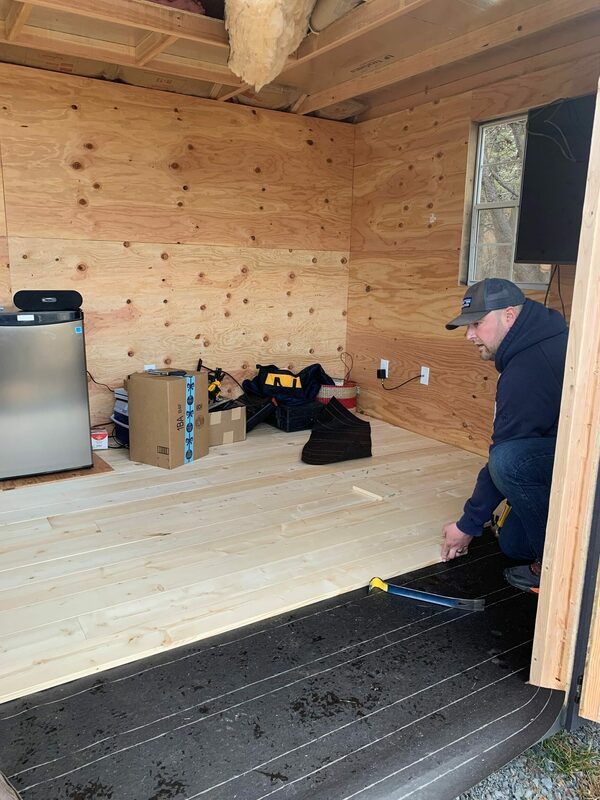 When the shed arrived, it had just plywood for both so I was excited to get started and get some walls and floors down. 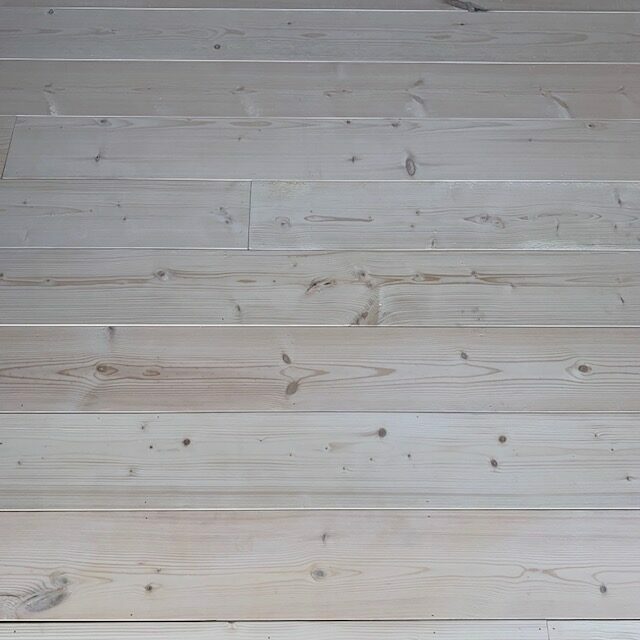 For the floors, we went with pine 1×6 boards. 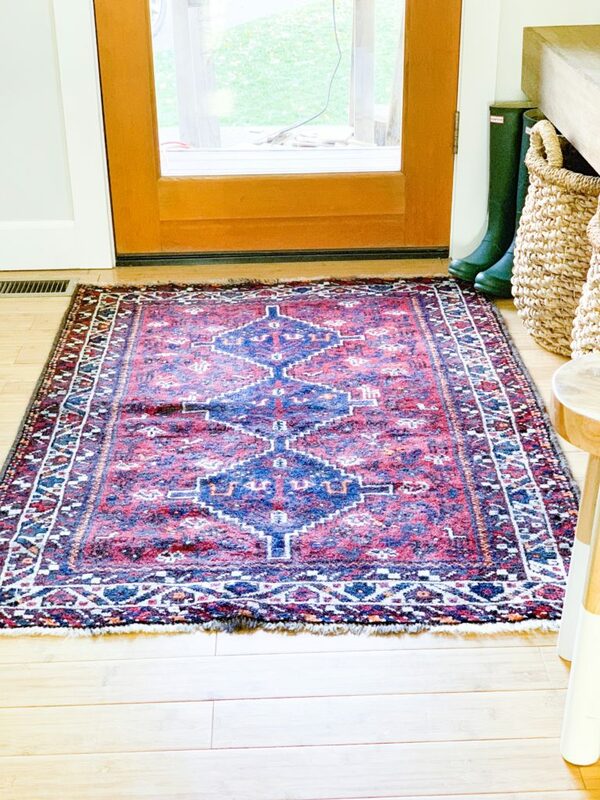 Originally, I was just going to leave them as-is, and add a poly for a protective coat, but then a reader informed me (you guys are SO helpful…keep sending me all your tips) that if I went that route, the floors would darken over time leaving us with a 1950’s cabin vibe (a look that I love, actually), but not the Scandi look I am going for for this project. So…in order to keep these floors from darkening, I am going to use a white stain that I’m hoping will keep them light and bright. I considered a lime wash, but was discouraged when I started researching the process. Seems so complicated! For now, the plan is to stain with a transparent white stain and then lots of poly to protect and seal them. 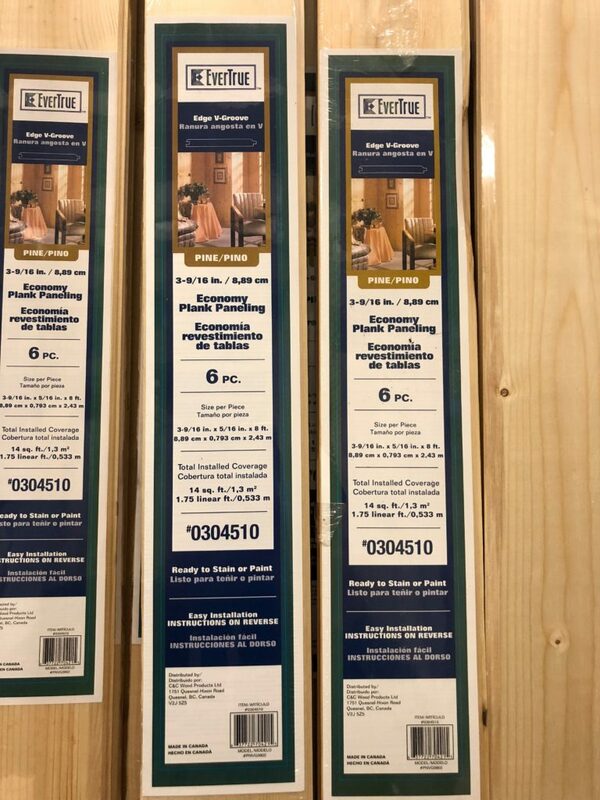 For the walls, we are going to use the same tongue and groove pine planking that we used for our stair well project that we completed this winter. 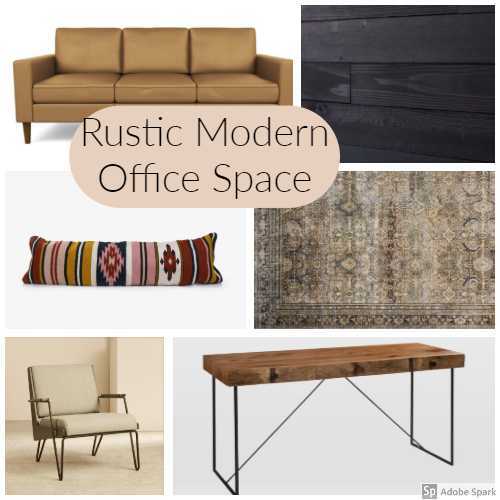 I’m a big fan of the texture that it brings to a space. 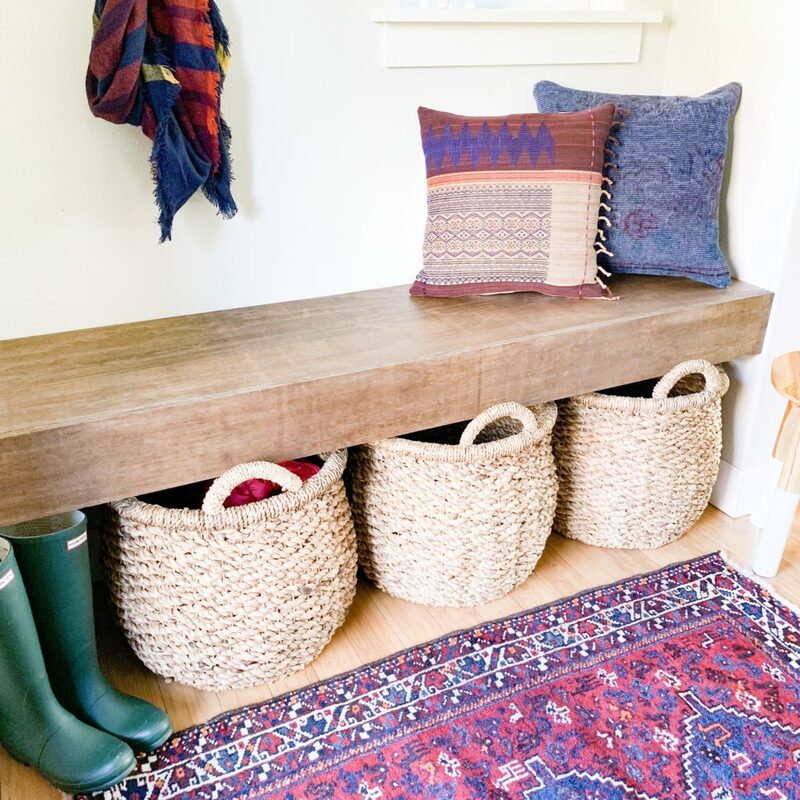 Also, it lends itself to a more casual look and I’m all about casual, comfortable spaces. 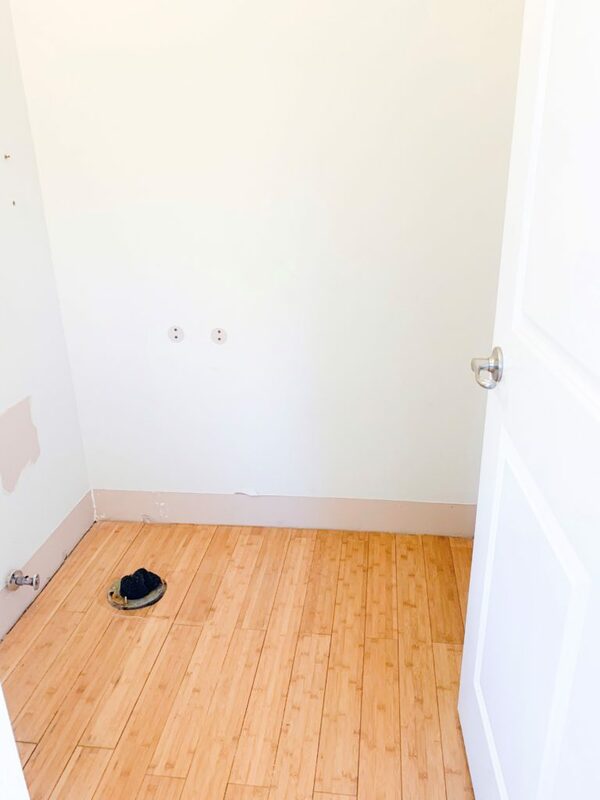 Because the floors are going to be so bright and natural light isn’t an issue for this office space, I am thinking about painting the long wall (the one that doesn’t have a window) a deep, matte black. Originally, I was contemplating trying the shou sugi ban technique, where you actually singe and burn the wood for a dark and dramatic effect. 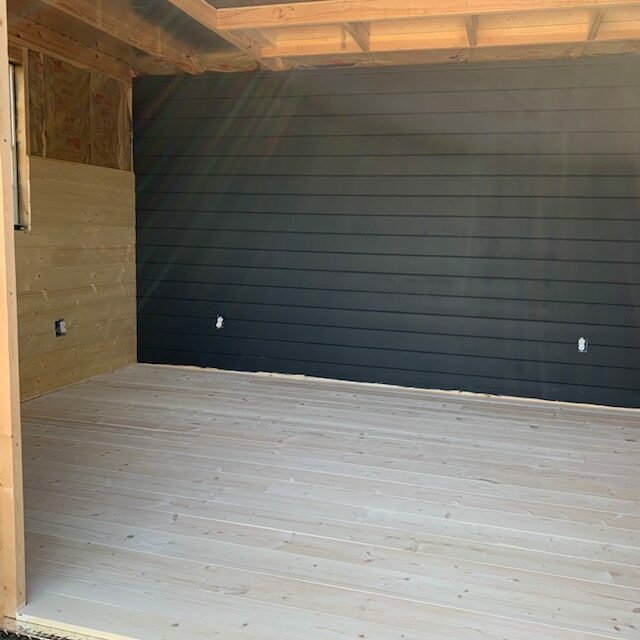 But, since the paneling is already installed and I don’t want to burn the shed down, paint will have to do! 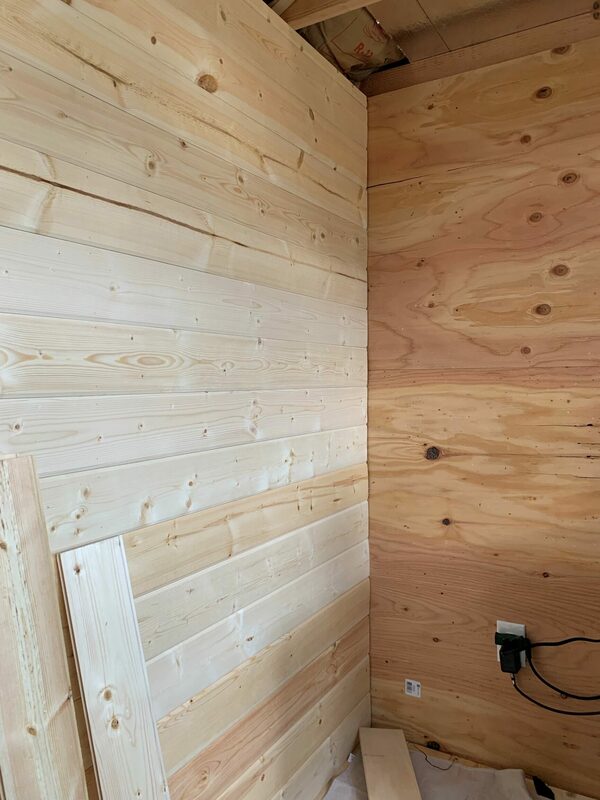 See how much lighter the paneling is (on the left) versus the old plywood (on the right)??? 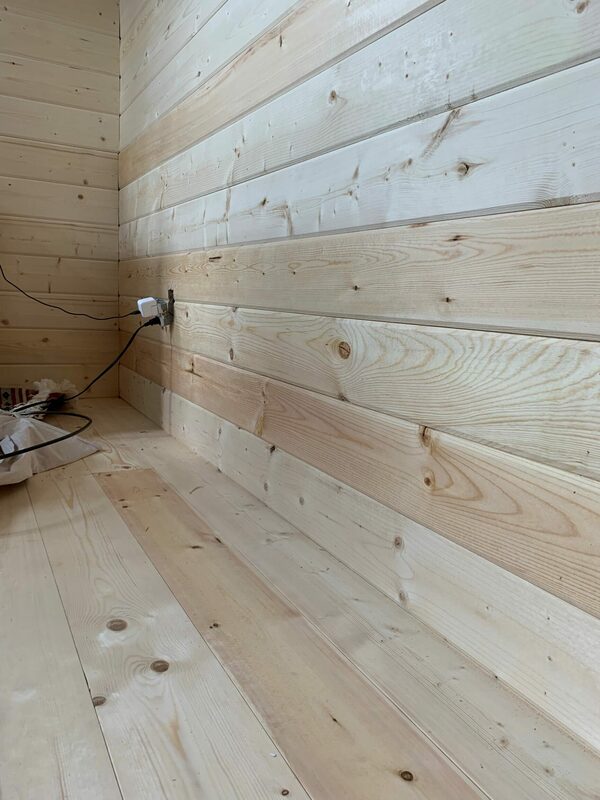 The plywood has a lot of orange and pink undertones that I am just not feeling. 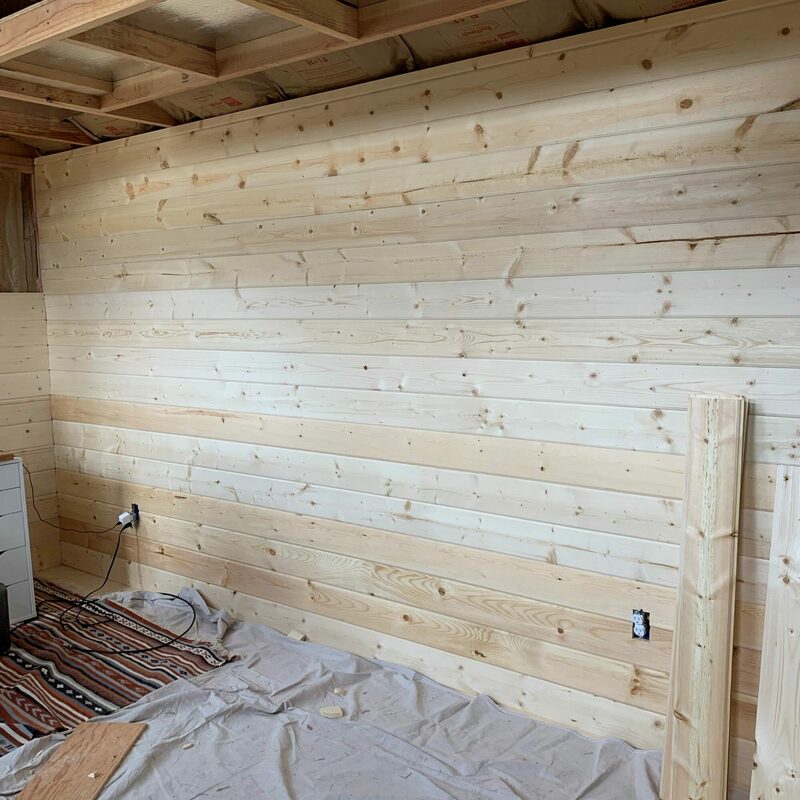 This project is really making me get creative because I LOVE a rustic look, but for the shed, if I go too rustic, then it starts to resemble that murder shack look that I am desperately trying to avoid. So balance is the key here, folks. So that’s the skinny on our progress for our second week! 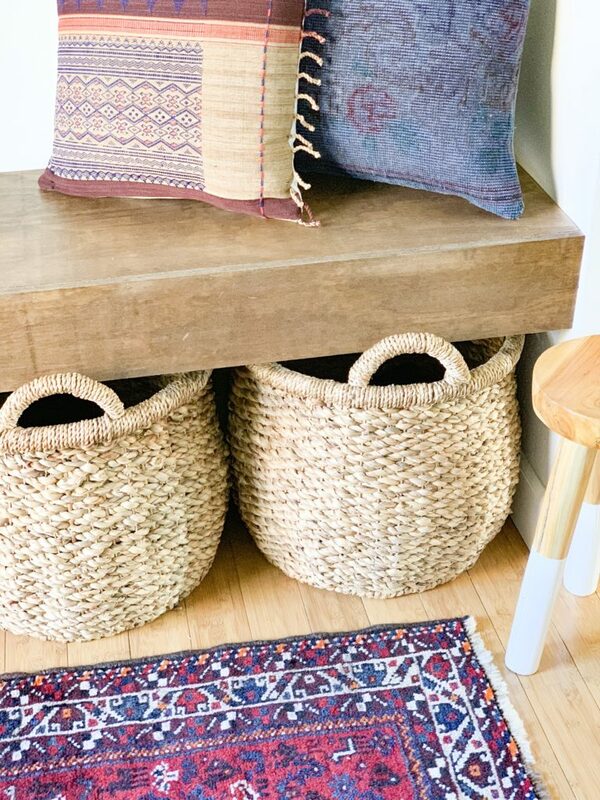 Guys, I cannot wait to get to the pretty stuff…furniture, lighting, accessories….ya know, the fun part! Have any questions for me? Hit me up! Until next week! Well….here we go again! 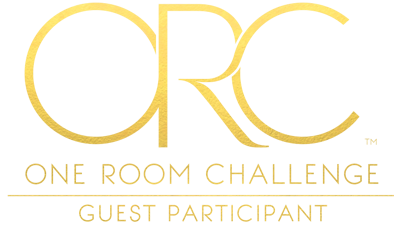 It’s time start another round of the One Room Challenge…only this time, spring edition 2019. 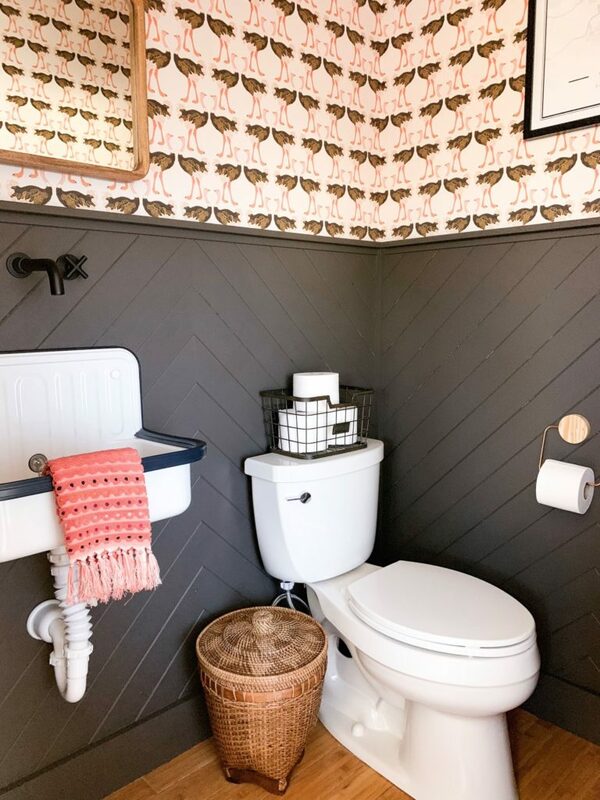 Last fall, was my first stab at the ORC and I had so much fun transforming a boring little half bath into a rad, ostrich filled powder room. So, I’m back again, but with a whole new game plan! Here’s what I’m thinking! Now, as some of you know, my hubs works from home full-time. 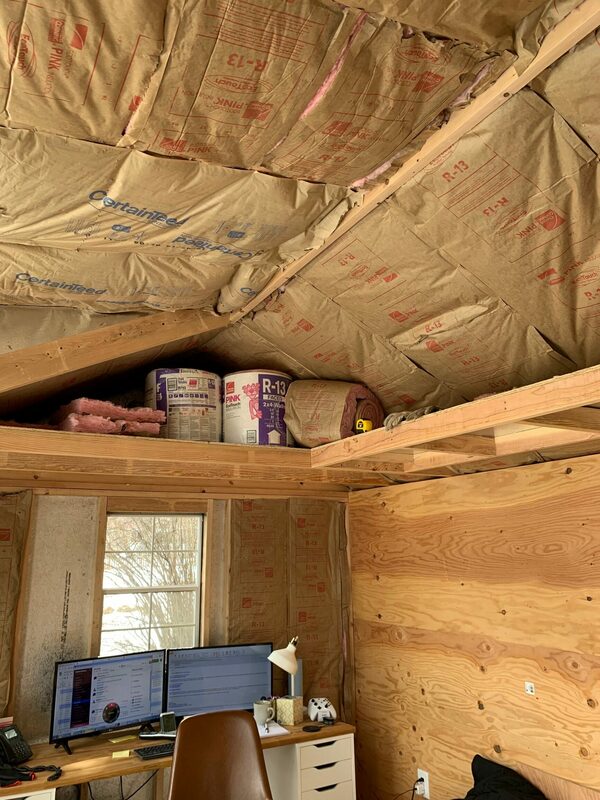 When we first moved into our house, we made the loft area at the top of the stairs (the space that I now lovingly refer to as the mom loft) into his office. 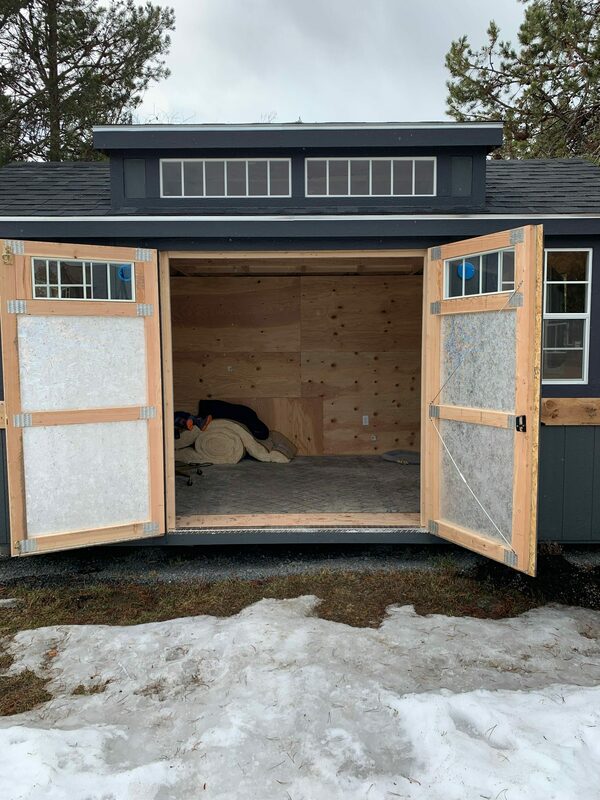 Well, it didn’t take us long to figure out that that space was not going to work…think screaming toddlers, barking puppies, and a constant flow of kids coming and going with their friends. 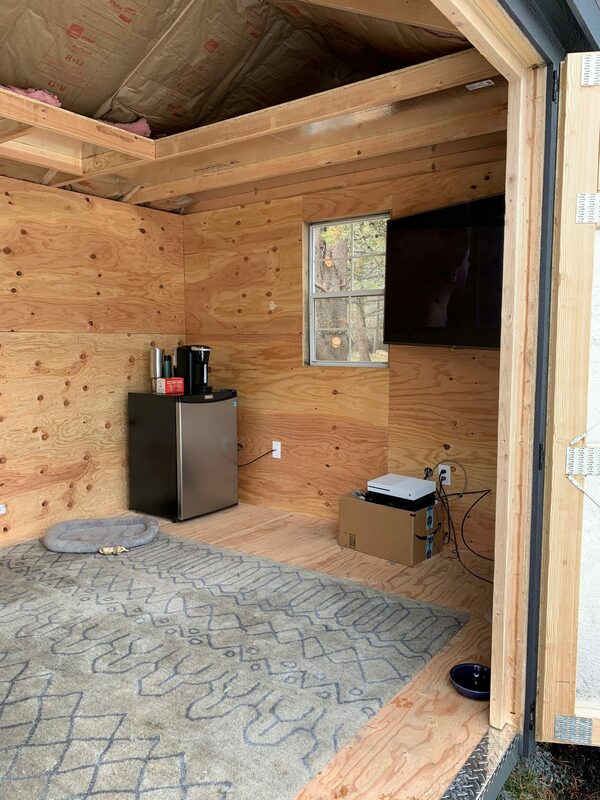 My hubs needed a quiet place to work so we had to come up with a solution that would better suit the needs of our very busy, and very LOUD family. 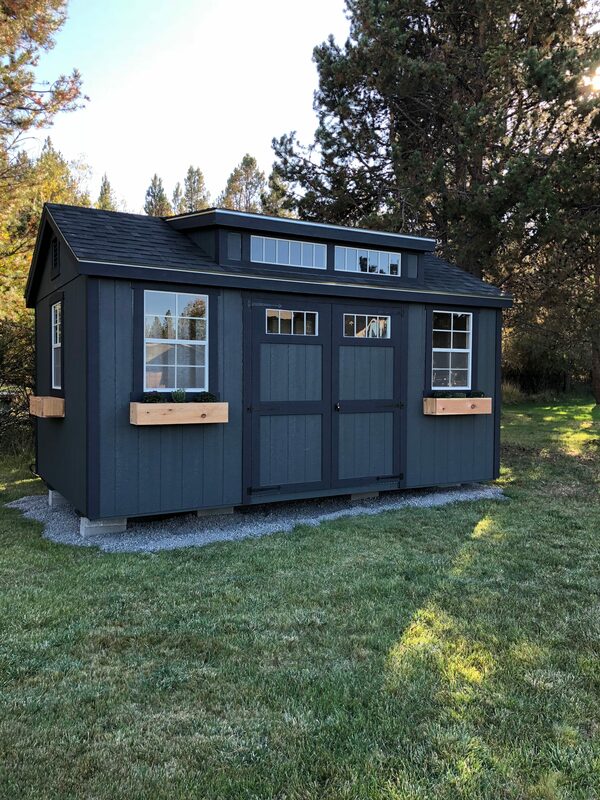 After some research, we found a local place where you design your own shed online and they bring your designs to life and build it on site. The whole process only takes a few weeks and then they come and deliver your new shed in the spot of your choice. It took some convincing by the hubs, but eventually I caved and here we are! Okay, here’s our starting point. A truly blank slate. We added the window boxes that you see but they didn’t make it through the winter…but that’s another story (insert eye roll here). We also added electricity, cable/internet and have also wired it for two exterior lights that will flank the front door. 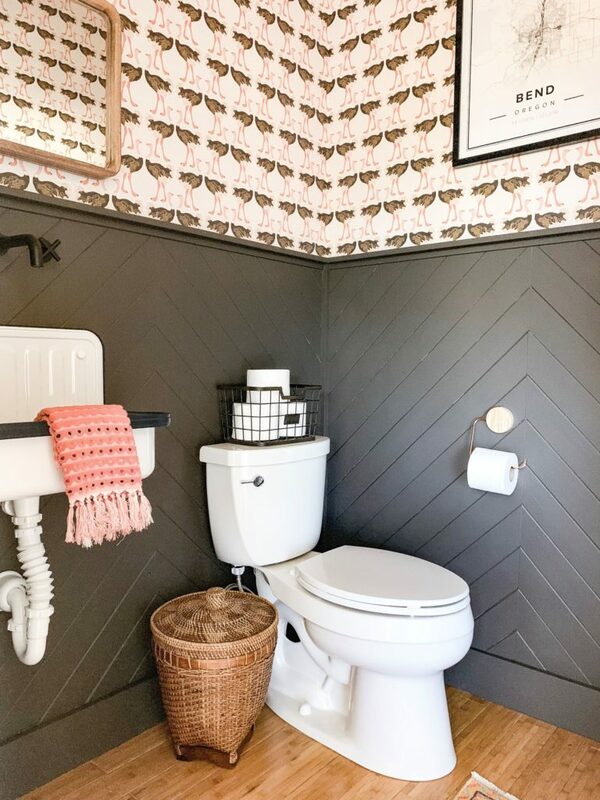 The outside is cute….but wait until you see the inside…gulp. 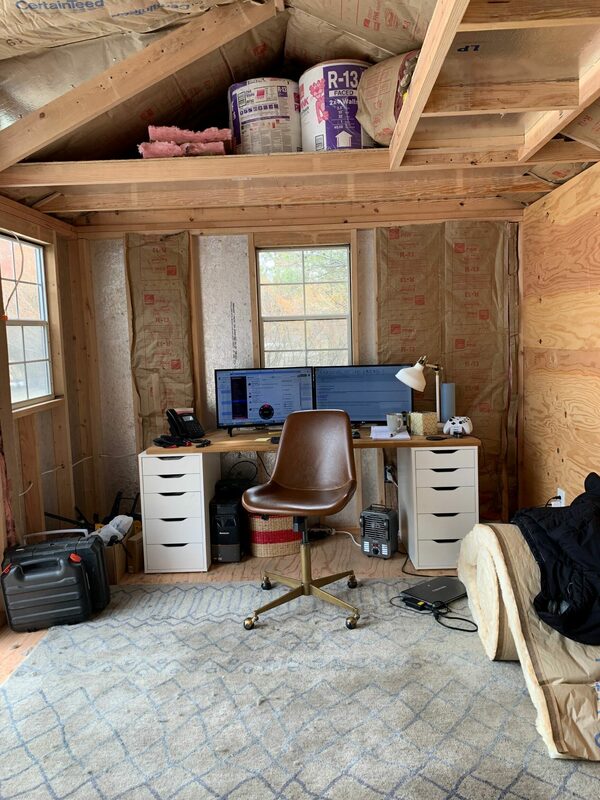 Ok…so the goal for this project is to transform this murder shack into a cozy, rustic office; heavy on the PNW vibes. 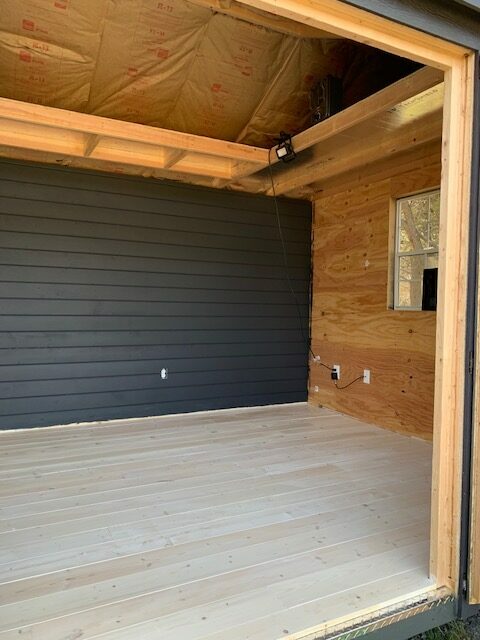 The walls will be shiplap all the way around and the long wall without any windows is going to get the shou sugi ban treatment. Can’t wait to try that! 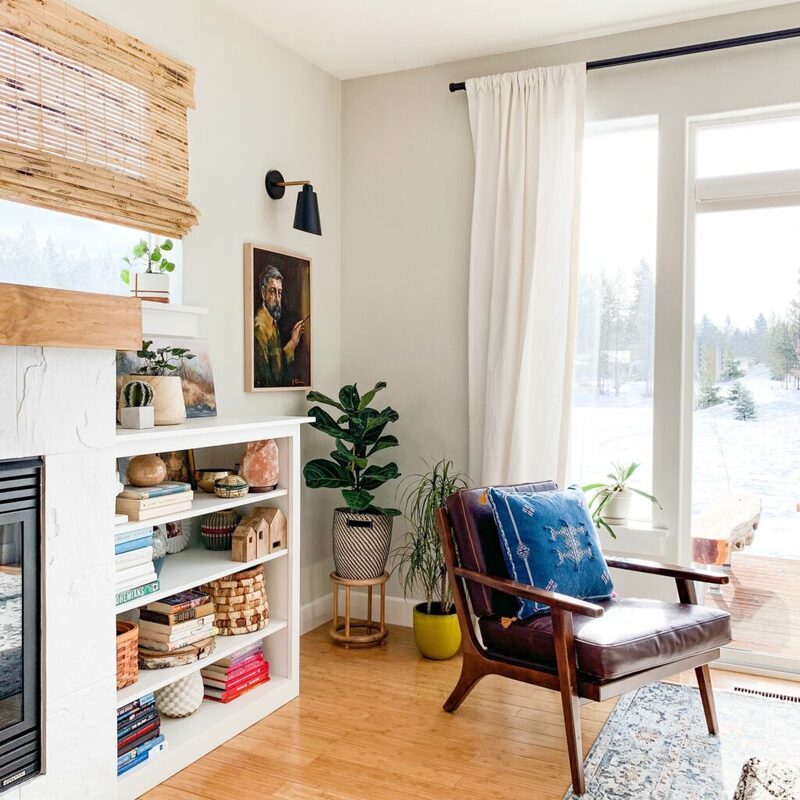 If I can find one that is the right size, a wood stove for the corner and a built-in to house some stacked wood. His desk will stay in the same location but we have a new desk picked. There will also be a seating area to hang out for when one of the kids or myself go out to deliver a hot coffee or a sandwich for lunch. This is just a quick run-down and meant to give you an overall and very general idea of the direction that I’m heading. That’s it for now! And stay tuned because I have a few surprises up my sleeve too! See ya next week! Hiya guys! 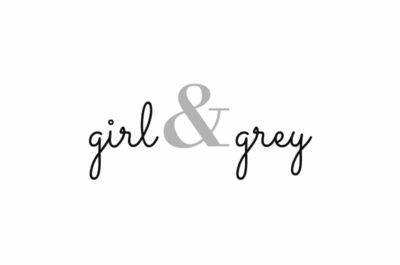 Long time, no see…errrrr blog?? Anyways, I’m writing today to talk curtains. 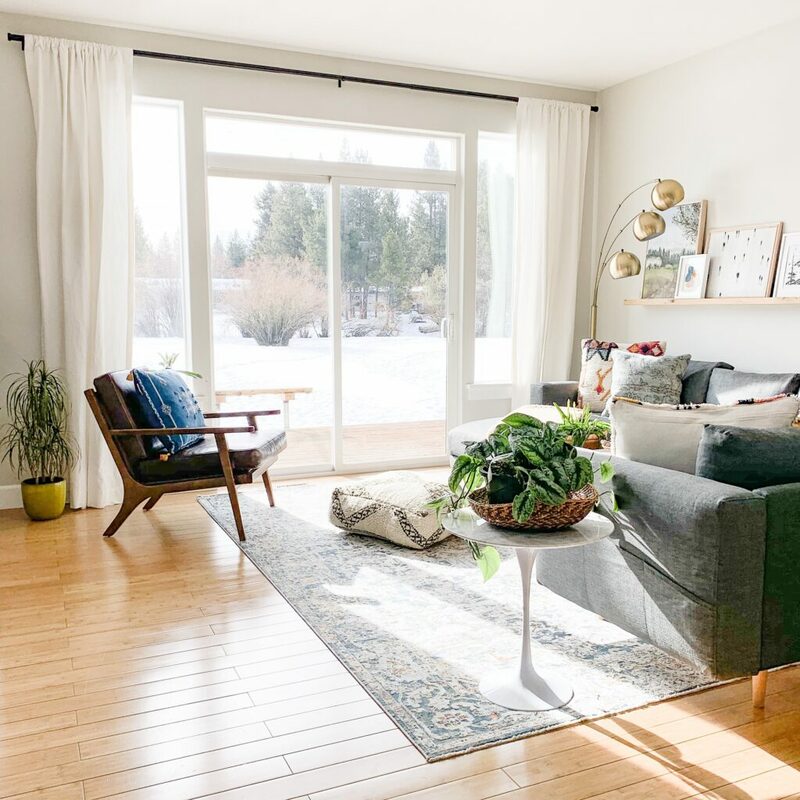 And to admit that I am guilty of committing a big faux pas when it came to hanging curtains in my living room. I know, I am ashamed. I now see the error of my ways, and am trying to redeem myself. 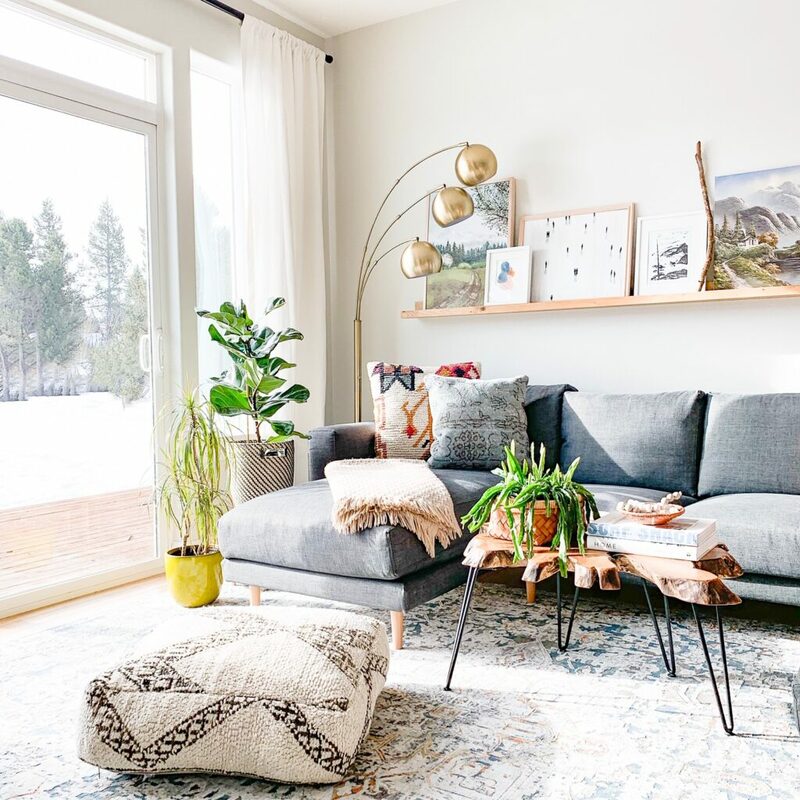 Wait until you guys see how some new curtains DRAMATICALLY changed the look and feel of my living room! Having nice curtains somehow makes me feel very adult. I liken it to spending a Saturday shopping for a new refrigerator or getting excited at the checkout line at the grocery store because the checker offers up a coupon for one of your items. Both things I love! Anyways, back to business…curtain business! Here is my old curtain situation and a perfect example of how NOT to hang your curtains. 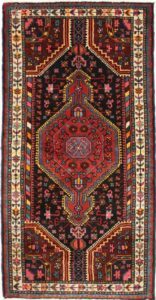 I was making a couple of mistakes that are often made when hanging curtains. The panels were too short which forced me to hang the rod just slightly above the window frame. It leaves you with a very blah effect, and nobody wants blah! Let this be a lesson to you, and learn from my mistakes. 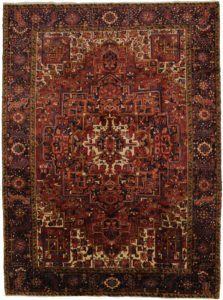 If you lift the rod, it lifts the eye which makes your ceilings look higher and your space bigger. 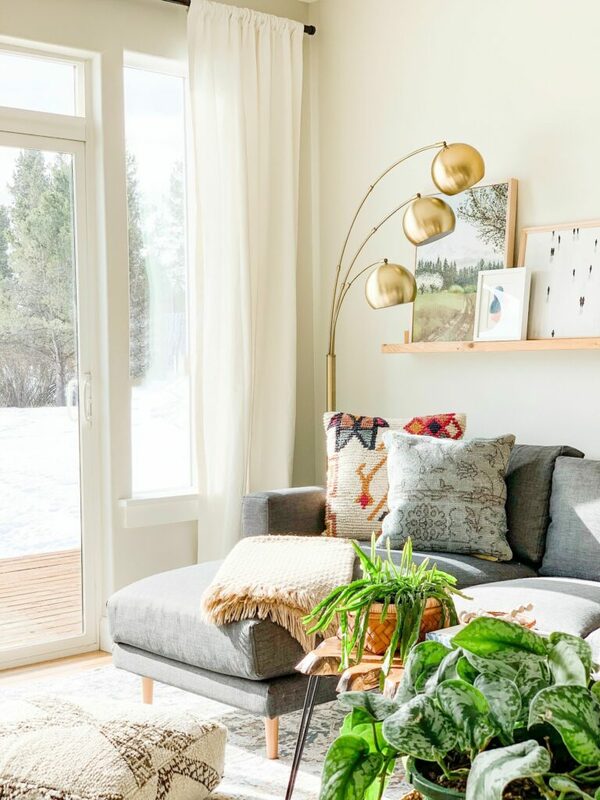 Another common mistake is not having the rod wide enough (also guilty of this), on both sides of the window, so that your curtains are forced to be hanging partially over the window, blocking light and making the window look smaller (windows look small = room looks small). 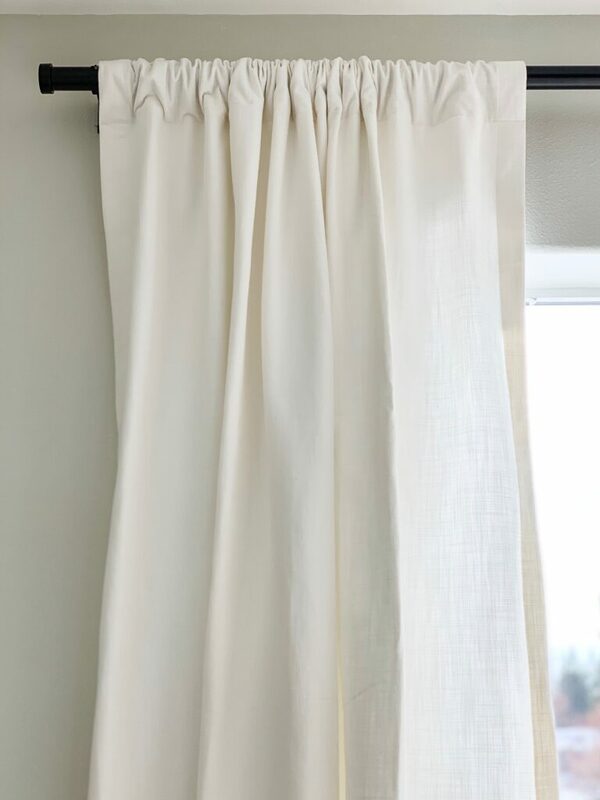 Extend the rod at least 6-10″ on either side of the window frame so that when the curtains are pushed totally open you can see almost all of the window. 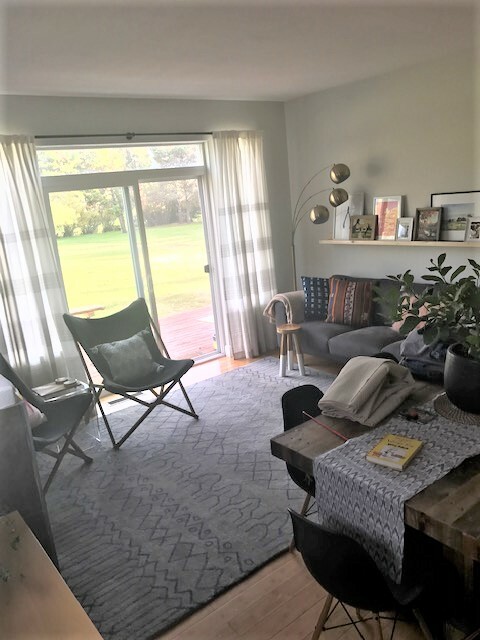 I partnered with Barn & Willow and replaced these tired, old panels with the most beautiful drapes…notice how I used the word drapes instead of curtain? It’s because I’m fancy like that, now. But seriously, it was such a fun process to choose my new panels because they allow you to get the exact look that you have in mind. I wanted my new panels to look light and bright, so I chose their organic cotton panels in the ivory color. They even allow you to decide how you want the tops to look with pleats, the style of pleats, or a soft top. Yes, really! I didn’t realize that I had a preference until I went through the options and studied the differences between all the different looks. Isn’t that such a cool option?! This is my panel with the soft top option that lends itself to a more casual look, which I love! I chose these panels, and am so impressed with the texture and weight of the fabric. They definitely look and feel like a quality product. 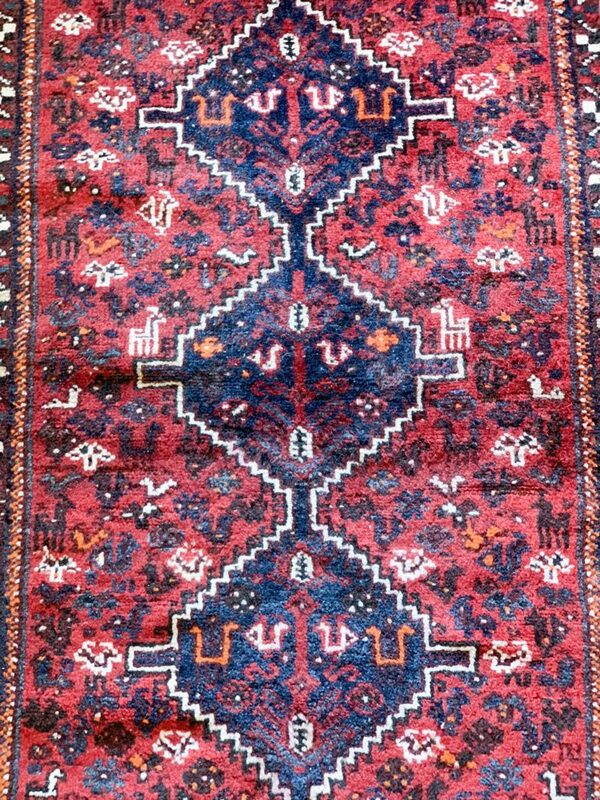 And as a bonus, they are fully lined and have drapery weights at the bottom of each panel. Why weights, you ask??? Well, they make your curtains look better! 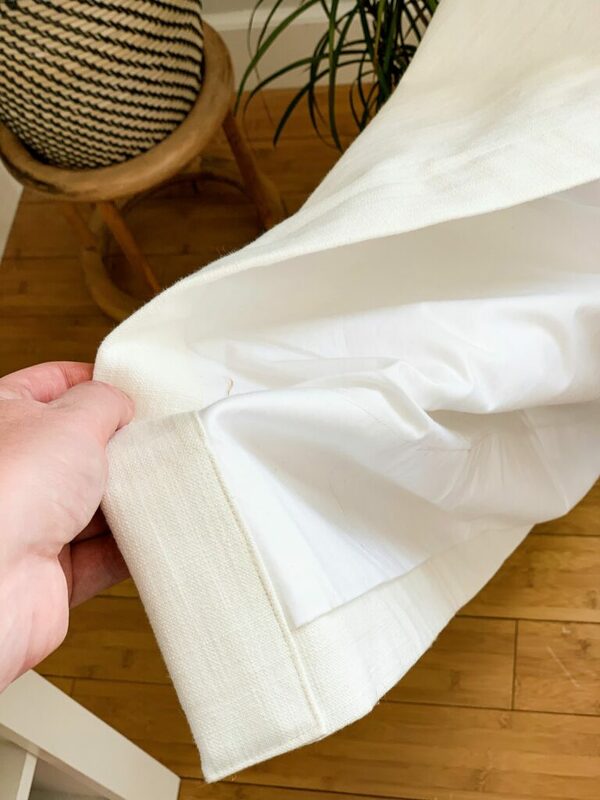 The weights keep your pleats in place and make it so they don’t flap about. A little detail that makes them feel so special, ya know? Now, on to the pretty pictures. What do you guys think? Isn’t it amazing how different my living room feels? And did anyone notice how much bigger my windows appear? My living room feels so fresh and bright now! A BIG thank you goes out to Barn & Willow for sponsoring this post, and for being so helpful and patient! Thank you for reading and Happy Spring…only one more day!!! Ohhhhh myyyyyy goshhh….today is the day! It’s been six weeks in the making and I am so excited (and SOOOOOOO relieved) that today is FINALLY reveal day for the One Room Challenge! Are you ready for this? Ok – first, if anyone needs to catch up, here are links to Week 5, Week 4, Week 3, Week 2, and Week 1. Also, let’s take a walk down memory lane to remind you what this space used to look like. 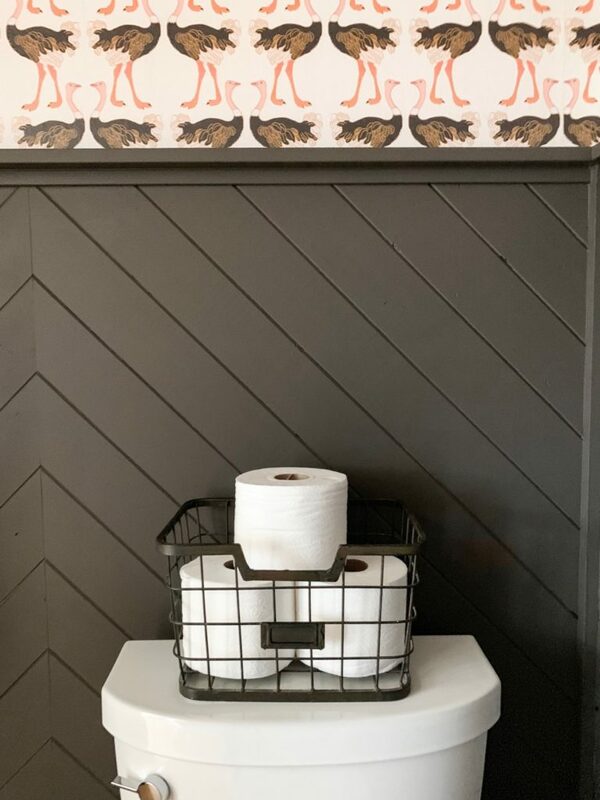 This little powder room is just off our front entrance so this update was much needed as it’s one of the first sights you see when you enter our home. Did you just die of boredom? Or maybe just doze off for a quick nap? Just me? Well…this new view is giving me all those good feeling feels. One of my goals for this house when it comes to design choices is to just go for it! Every wall (and ceiling) was beige when we moved in and so I am doing my best to inject some personality into this place of ours. 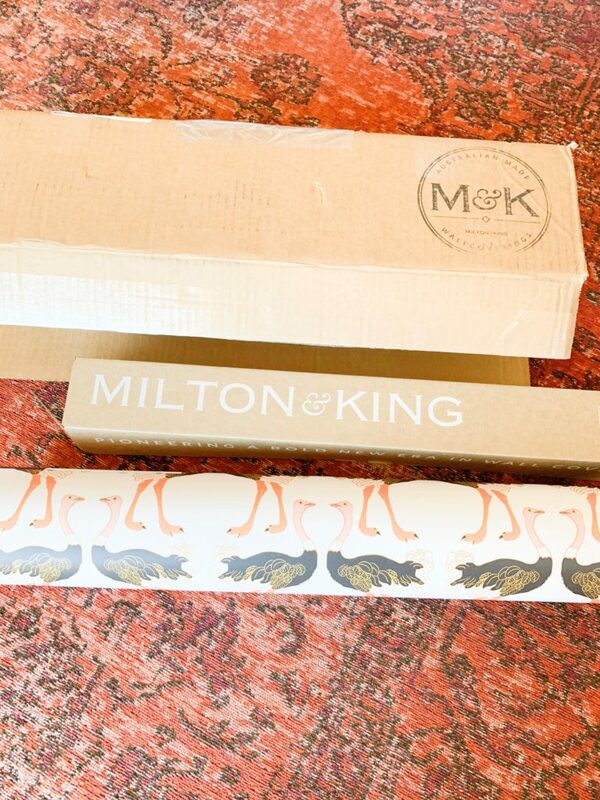 The room all started with when I found this wallpaper from Milton & King. Everything else was planned with this paper in mind. 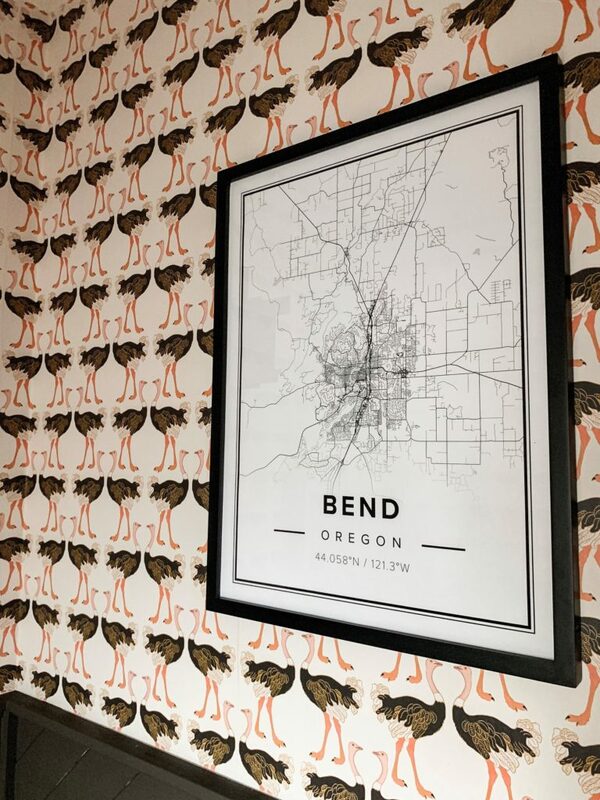 I wanted to keep the art simple and opted for a single statement piece with a map from Mapiful. 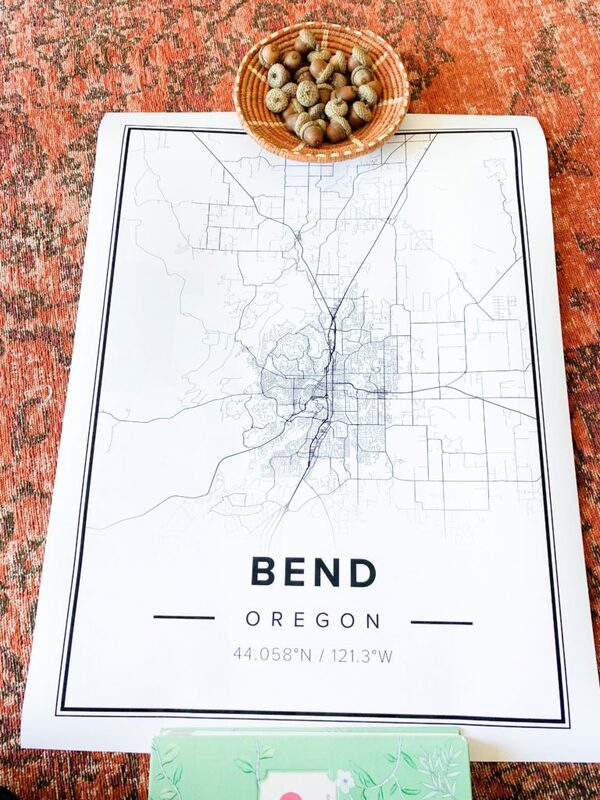 It was so fun to customize this baby with a simple black and white map of the city in which we live. It feels like a special touch! 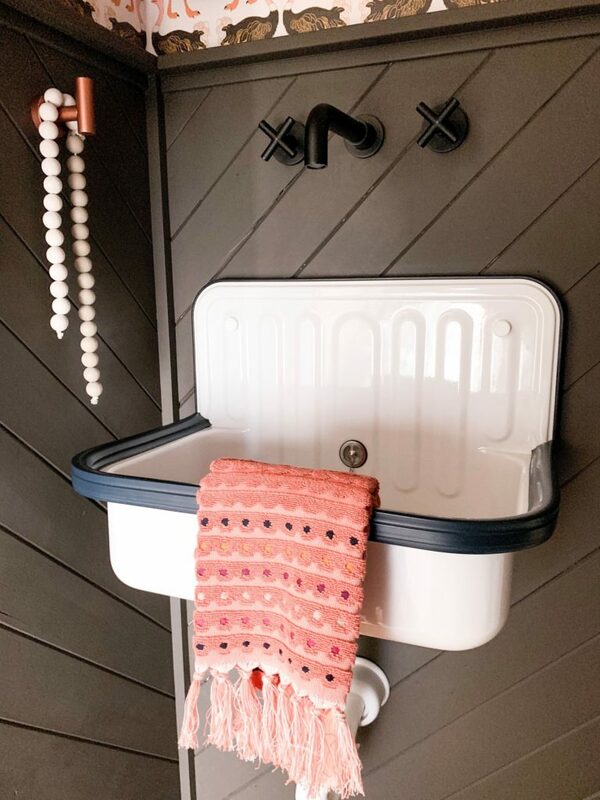 I’ve always loved this sink and think that it gives the room a funky, retro vibe. I’m so happy to have finally found a place to use it! 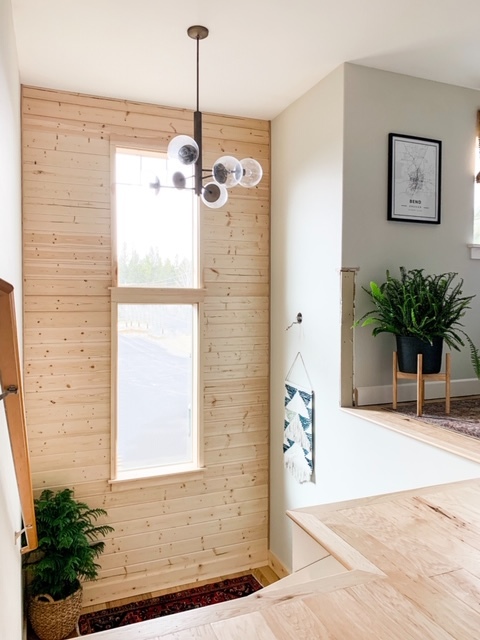 I wanted to keep the lighting modern and simple and I think this light from Modern Komfort works perfectly for this small space. 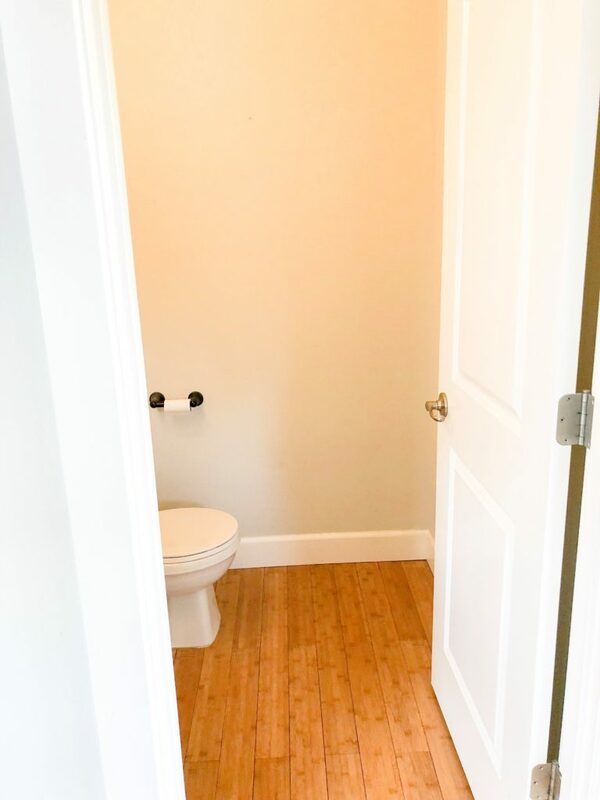 I’m so excited to have a new powder room for our guests to enjoy as we will have a house full of family while we host Christmas this year. 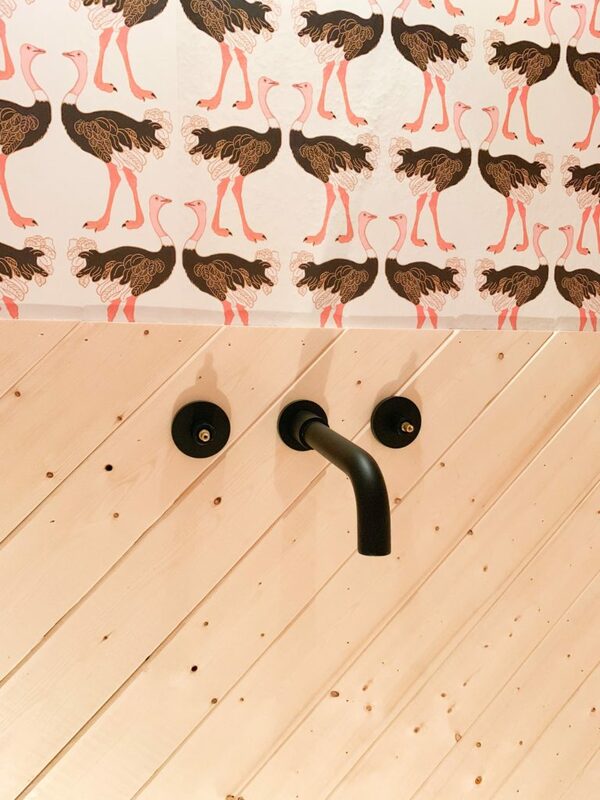 I owe my boo a BIG thank you for all his hard work and for not running away when I said, “I found some ostrich wallpaper that I wanna use in the bathroom.” Also, a big thank you to Phil, my dad, and my sister and her husband for donating their time to help me out as well! Welllll…what do you think? I hope you love it as much as I do! And be sure to check out all of the other reveals! I did a little snooping around today and have already found some amazing transformations! Well…it’s that time again! 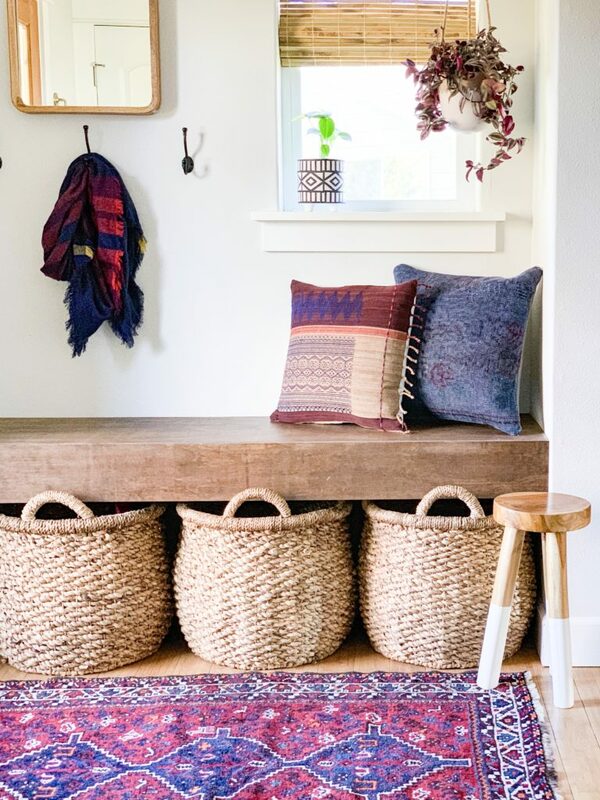 It’s time for the weekly update for the One Room Challenge. 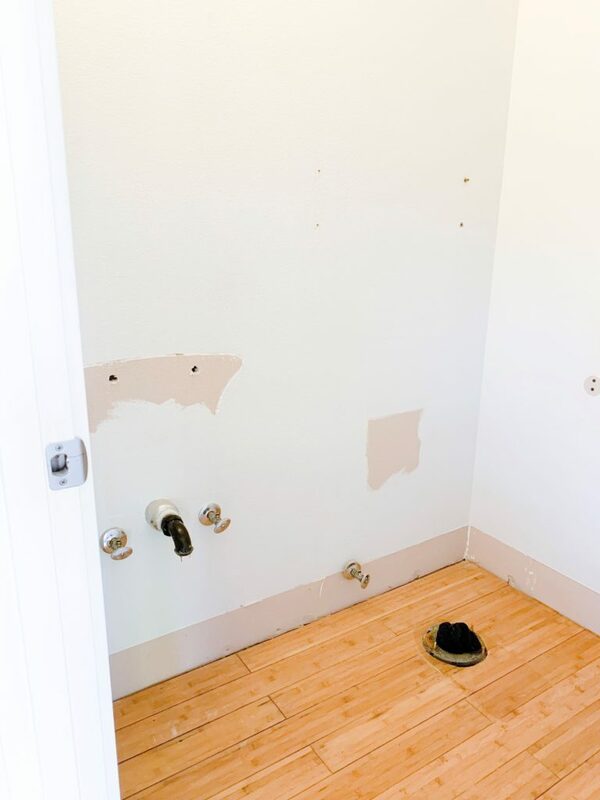 Can you believe it’s already week four of my bathroom remodel? 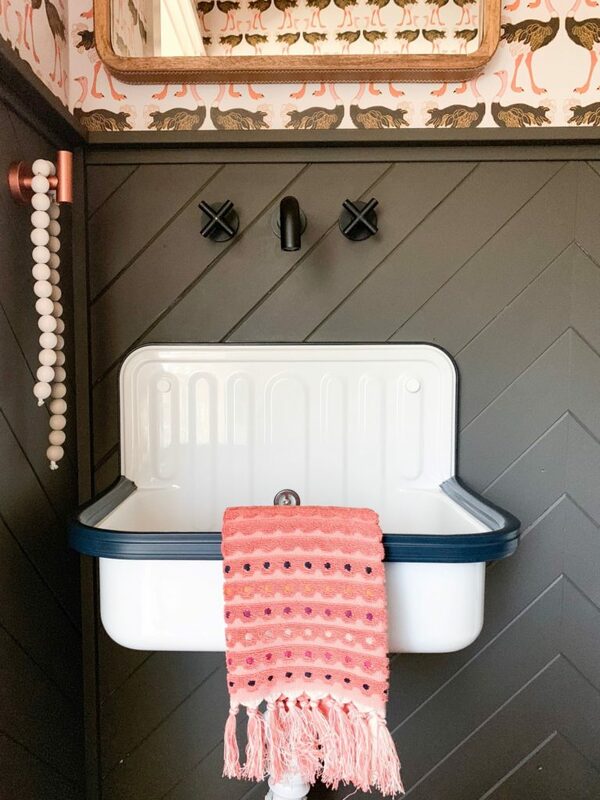 As a quick recap, I am redoing my bathroom over six weeks and am sharing the progress here, in real time, as part of the One Room Challenge. Here’s a link back to Week One, Week two, and Week Three. And just in case you need another refresh, here is the mood board that I put together as a sort of blue print and for inspiration. This week was a fun one! 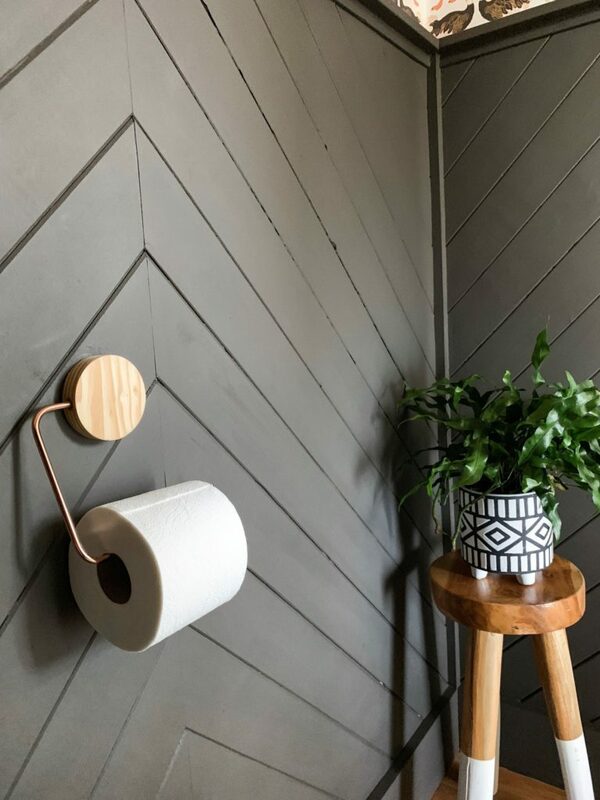 We spent the last few days wallpapering the bathroom and although I was a little nervous about diving in, it was actually pretty fun once we got into a groove! 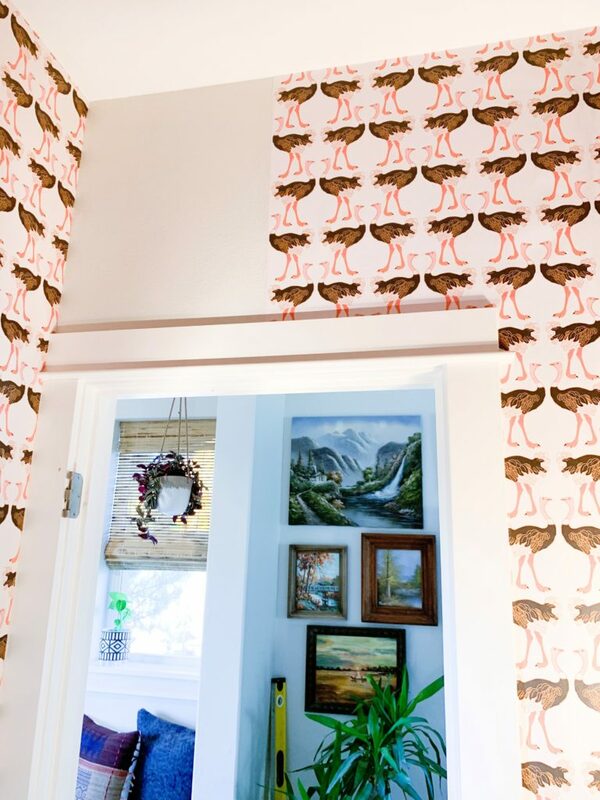 When the wallpaper arrived, I was so delighted/excited that I couldn’t wait to get started. I’ll give you the general rundown on the actual process of wallpapering so you can get the jist. The process is pretty simple and if I can do it, you can do it, too! It’s all about paying attention to details and making sure your lines are straight. Once you have straight lines, the process starts cruising. 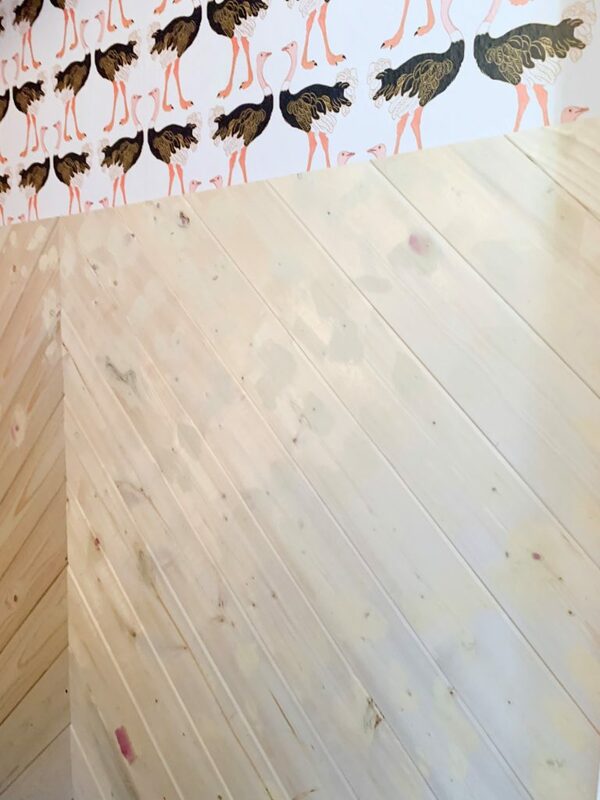 Measure first, and pre-cut your strips of wallpaper so that you aren’t measuring and trying to cut the paper when the adhesive is on the wall. Because we found that it starts drying really fast. We used a chalk line to mark straight lines and used that as a guide to line the individual pieces of paper to. 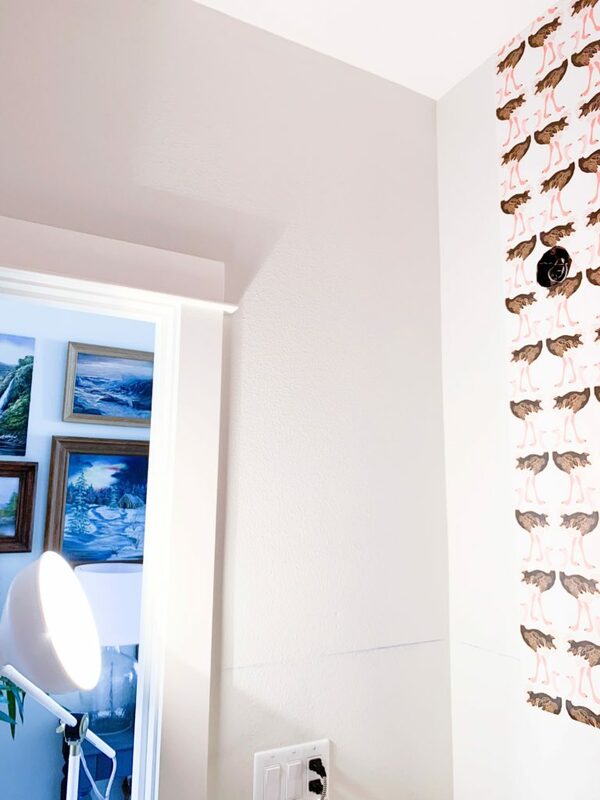 The adhesive goes into the wall with a roller, and the sheet just sticks right onto the wall. 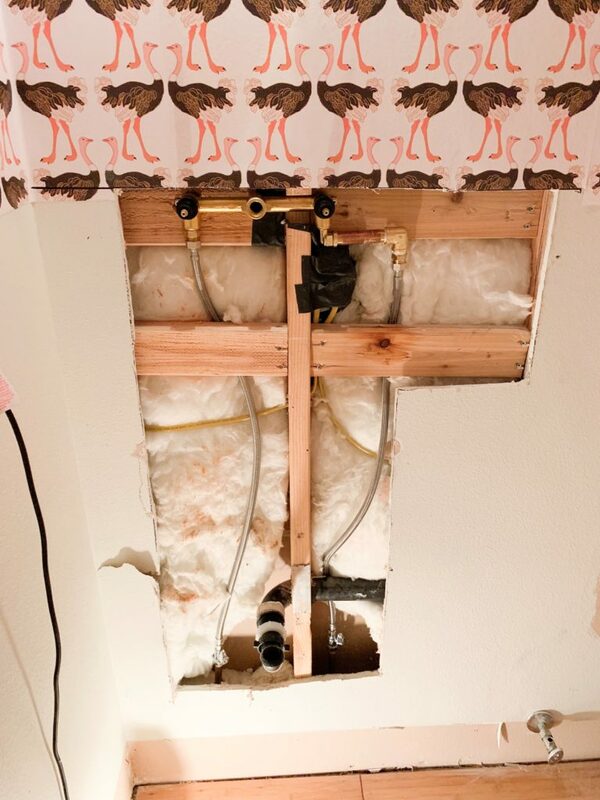 Start smoothing with your flat edge to get all the bubbles out and use a SHARP razor to make your cuts at the ceiling. Done and done! Like I said, this is a very short summary of the process. 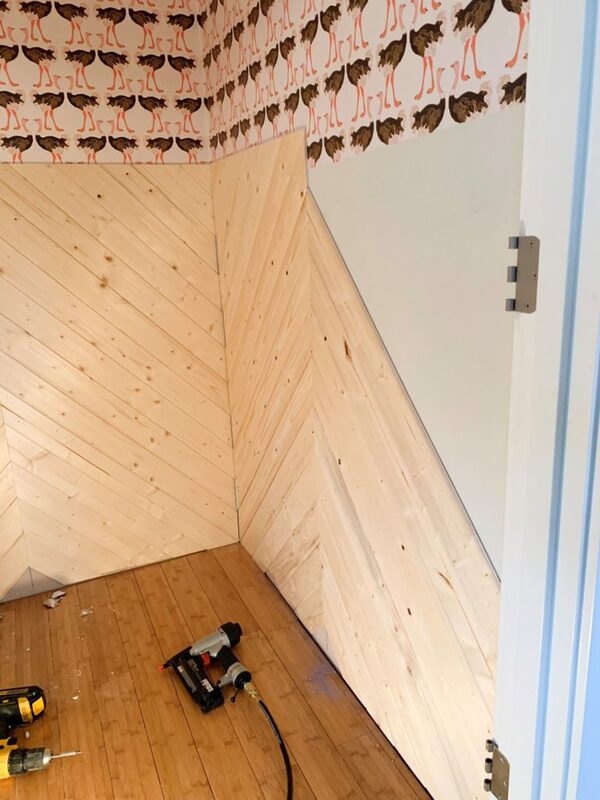 We decided we were going to st0p half way down the wall as we are installing wainscoting on the lower portion of the walls to really give this tiny space some pizzazz. The light fixture arrived yesterday and I’m smitten. It’s just perfect and looks so sharp next to all those black ostriches. 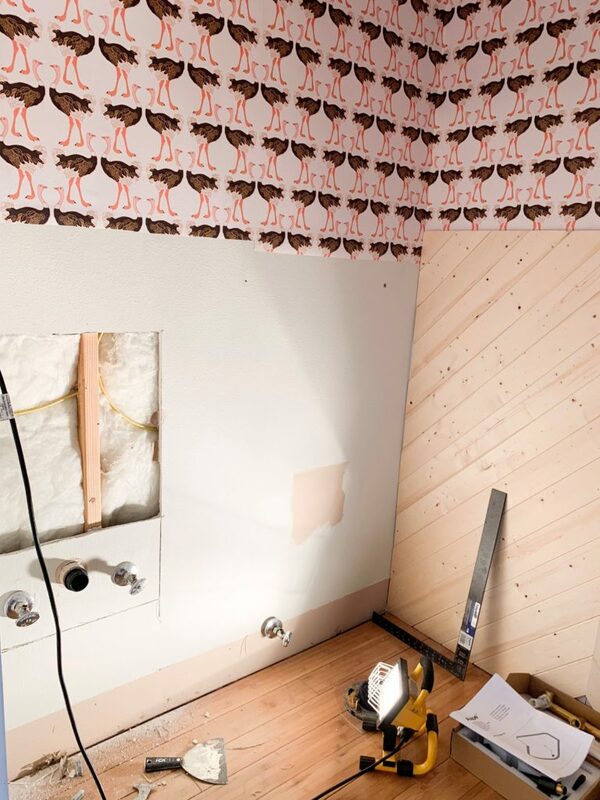 Now that the wallpaper is up, next on the to-do list is the plumbing. 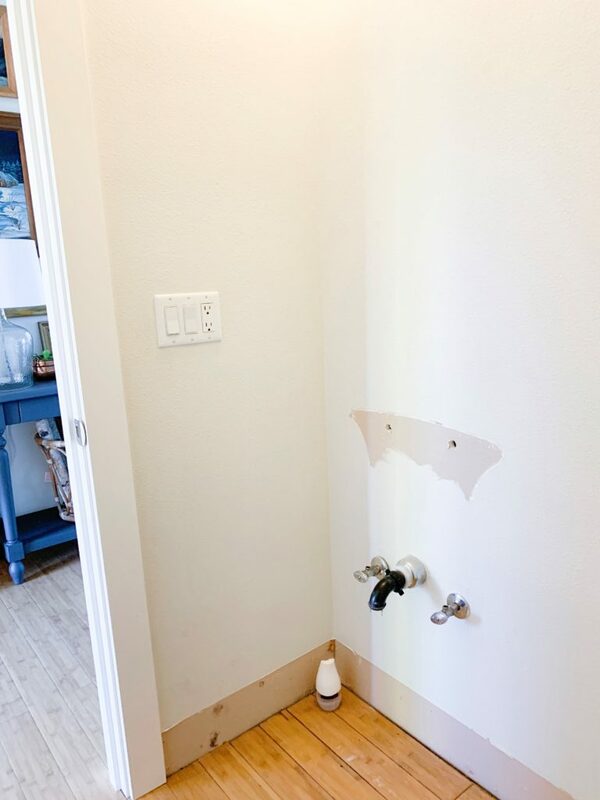 We are changing the plumbing so that it can accommodate a faucet that comes directly out of the wall. Once this is done, then we can start installing the wainscoting. My hubby started on one of the walls so I will give you a sneaky peaky. I will have to fill in all the knots and nail holes with wood filler and then all of the wood will be painted black. Or a color that’s very close to black. So that’s where we’re at! What do you think of the ostriches? Do you love them as much as I do? Anybody have any wallpapering horror stories they want to share? I sure read about some doozies online when I was doing research before we started. Only two weeks to go so I’ll be back next week with lots (hopefully) to report on! 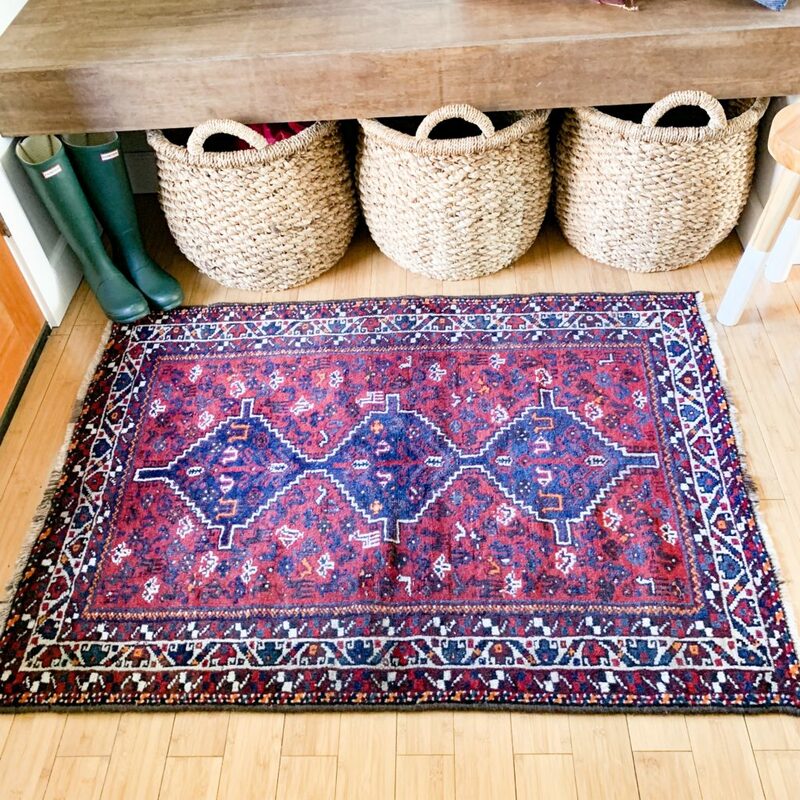 one room challenge: week three – DEMO! Hi all! 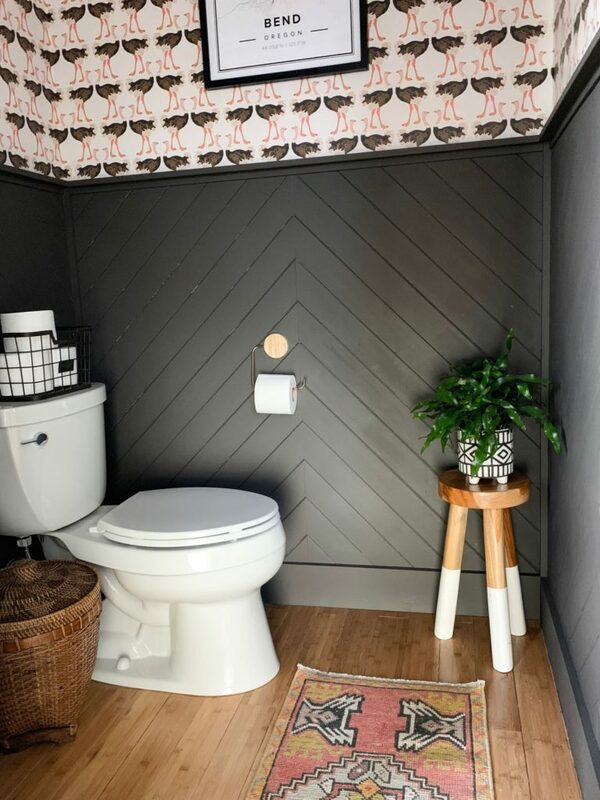 It’s week three of our funky tiny half-bath remodel! Time is flying! 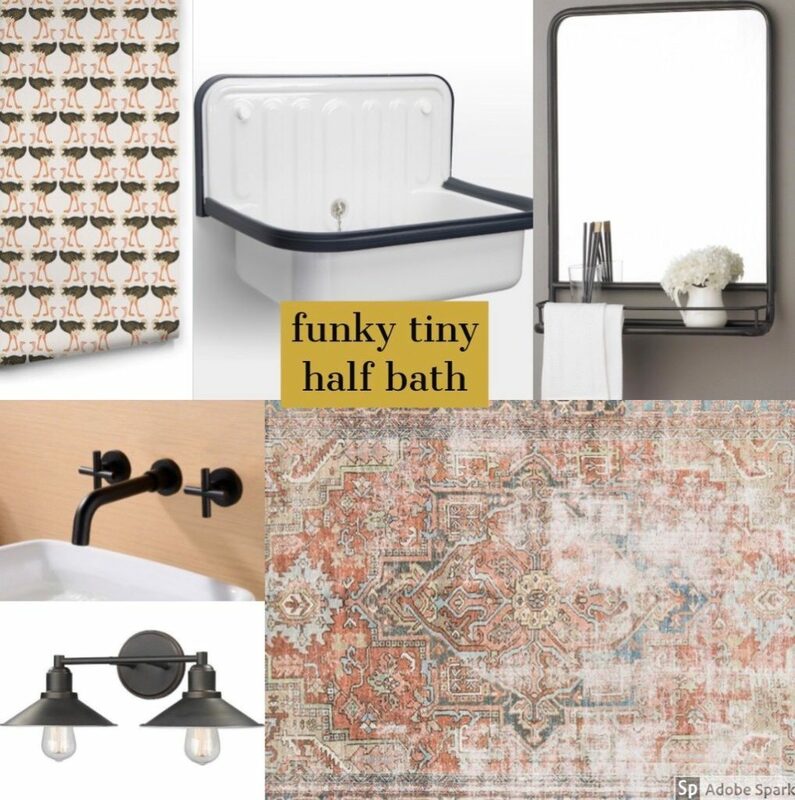 As a quick catch up, I am redoing our half-bath as part of the One Room Challenge. If you need to refresh your memory or maybe you’re new here (WELCOME! 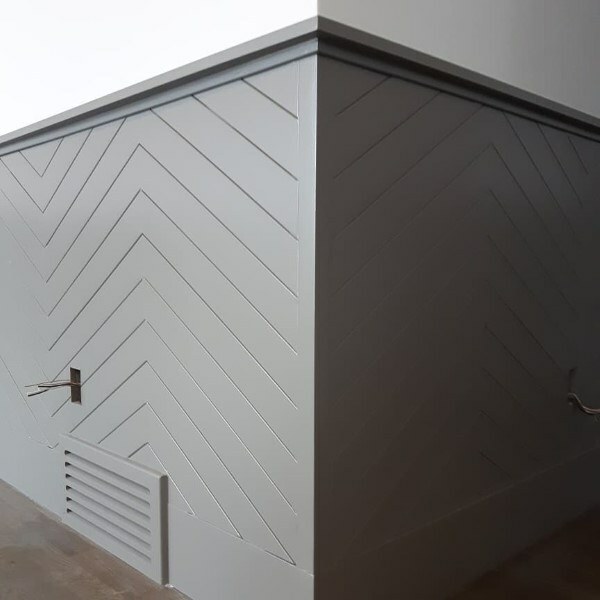 ), here is Week One with my mood board and Week Two with even more deets, and some very fancy wainscoting plans. So the biggest change this week is that we finally have a freshly demo’d space! I love this part so much. Taking out all the old helps me envision the new! 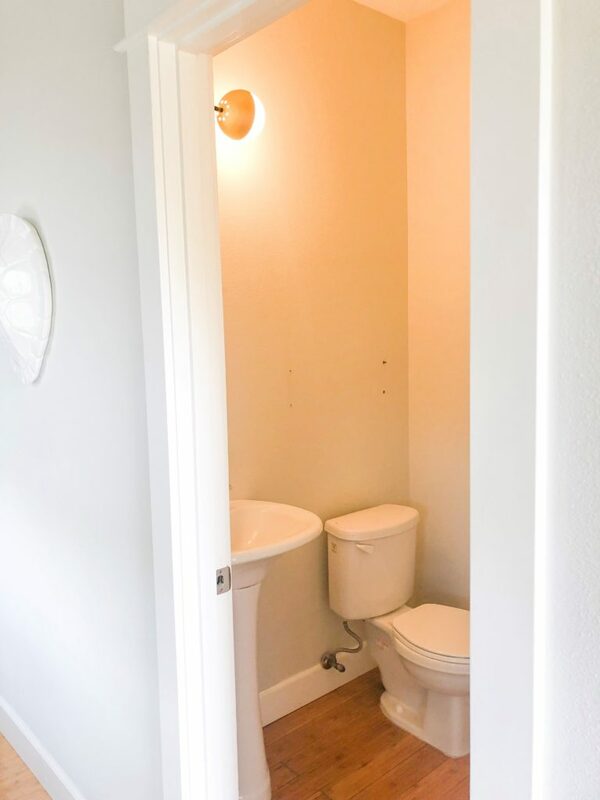 Goodbye tiny toilet! 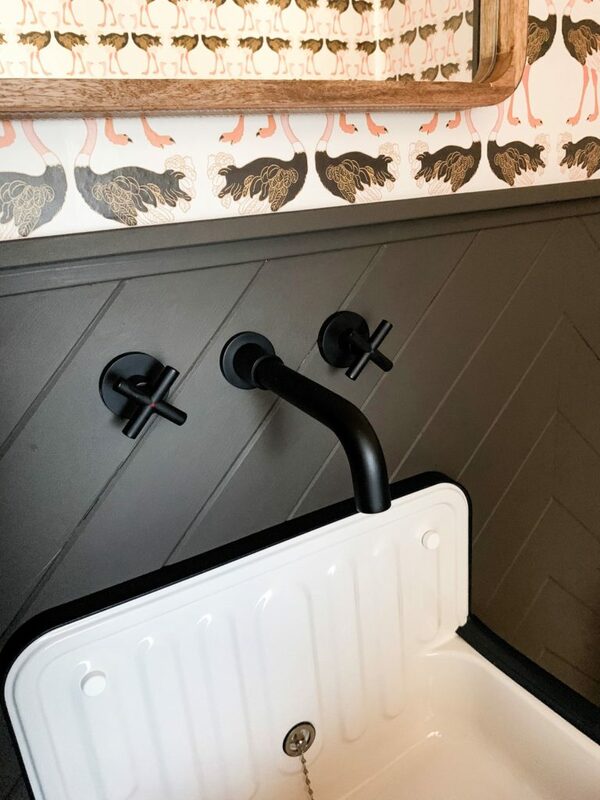 Goodbye boring sink! 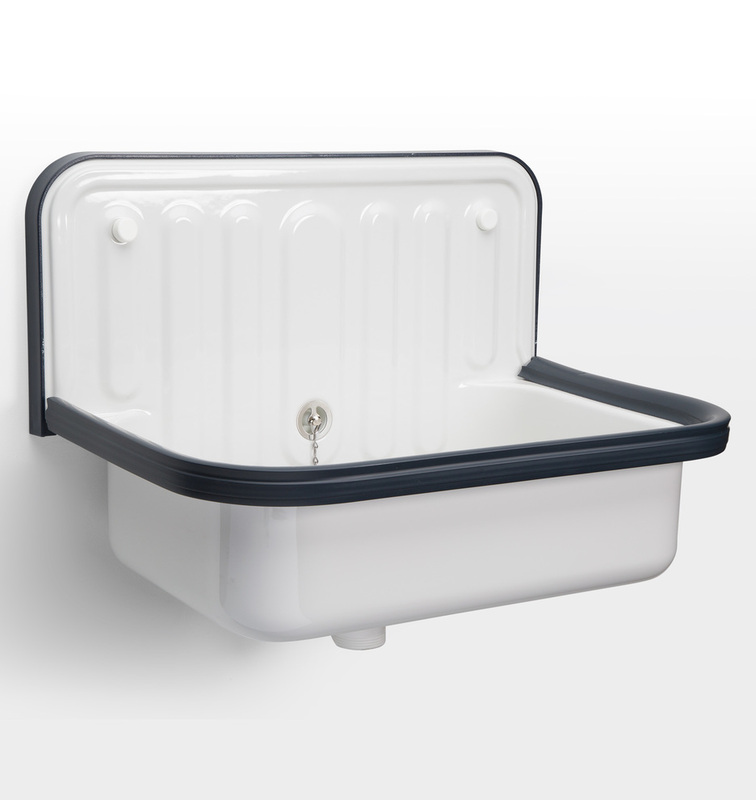 The most exciting part of this process is that some of the items that we chose for the bathroom have started to arrive! My wallpaper came (it’s amazing) and it’s going in this weekend. My sister has graciously volunteered to come over for the weekend and we are gonna get our wallpaper ONNNNNN. Love you, Collin! Also, a few of the accessories have arrived and seeing them in person is an absolute delight! Now the fun really begins! I’ll be back next week with some good progress for ya! 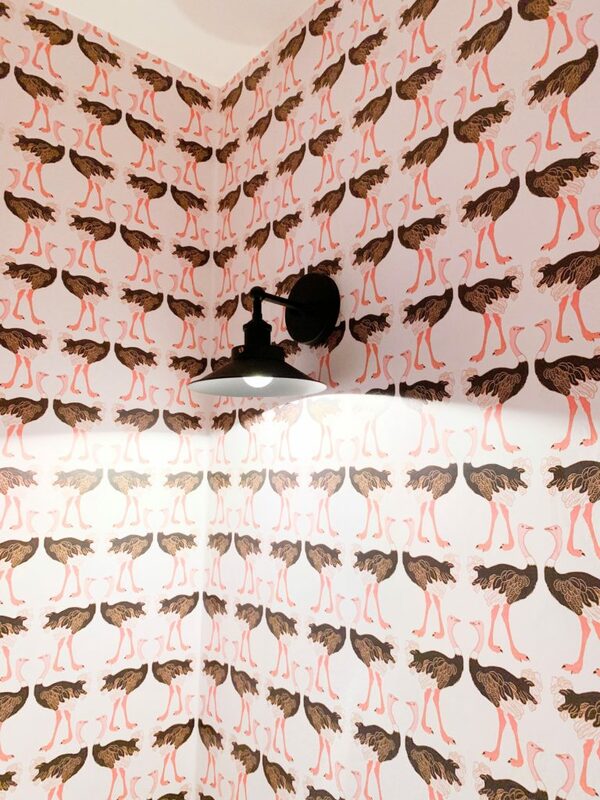 Now…does anyone have any wallpaper tips for me? Or maybe what NOT to do? This is my first time! Wish me luck!